So let's begin this reveal of our newest collection, "Beautiful Dreamer" by looking at the collection first as a whole, and then we can go more into detail and talk specifics about the different patterned papers, the embellishments, and the planner pages! First, I want to say that I really wanted to do a Sleeping Beauty inspired collection for a couple of reasons. For one thing, as I mentioned before, the story to me always seemed like a spring story and so I thought that with it being spring, finally, I would create a collection that really felt like a spring dream and represented exactly what I wanted this spring to be like for me! I want a spring that is magical and just full to the brim with beautiful flowers! Subsequently, this collection is just that! I packed this collection with lots and lots of awesome florals! There are other patterns, too, of course - some really cool geometrics, some pretty watercolors, and other fun patterns (like one with frames that I really love), but I particularly wanted to have a lot of different florals in this collection and I think I succeeded in that! The second reason I was inclined to do this collection now is because Disney's version of the classic fairytale is actually having its 60th anniversary this year! That's right, it just turned 60, and it is still lookin good! I love that version of the story and I felt like creating a collection that was inspired not just by the original story (which has apparently been around since the 1300's), but that was also inspired by the classic Disney retelling, and even the newer Maleficent version. I thought this was a fun way to celebrate this particular princess! I wanted to celebrate this princess whose story is so charming and reminds me so much not only of my childhood and springtime, but of Disneyland, my home...since it is her castle that is at the center of the park! And I also liked the thought of creating a collection that was inspired by a beautiful ideal that is put forth in a song within the Disney animated version. This song is called "Once Upon a Dream", and it is one of my favorite songs because it proposes that the person and the things in life that we love are first dreamed of in our hearts and minds and then known in the everyday reality of our lives...i.e. dreaming leads to doing. So with this collection, I call on you to be true to you and to your dreams so that what was "once upon a dream" can one day be known and come true for you! Alright, now that you know the feeling and the ideas that went into the creation of "Beautiful Dreamer", and which are therefore conveyed in this collection as a whole, let's now look at specific elements within the collection. Let's start with the absolutely gorgeous 12x12 paper that can be found in "Beautiful Dreamer"! 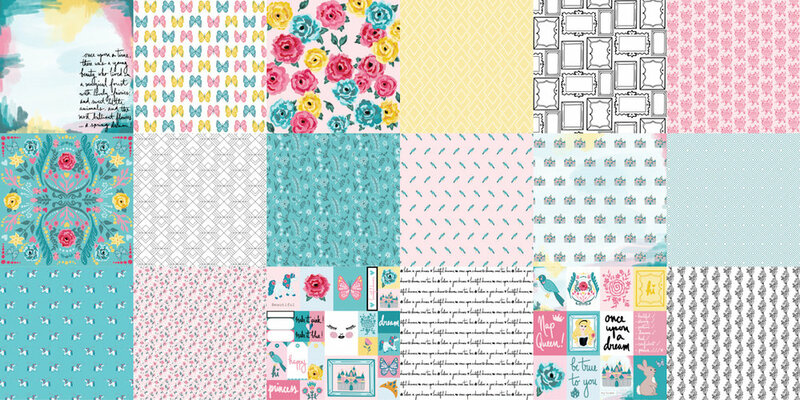 As you can see, the patterned papers in this collection have a beautiful color scheme of pinks, yellows and aqua blues and teals (as does the whole collection really)...oh plus some fabulous and bold black and white patterns as well. This first patterned paper is called " Flora, Fauna and Merryweather" and it is a beautiful watercolored paper with cool brush script on the front -- a fun "once upon a time" story excerpt. I love the way this looks! 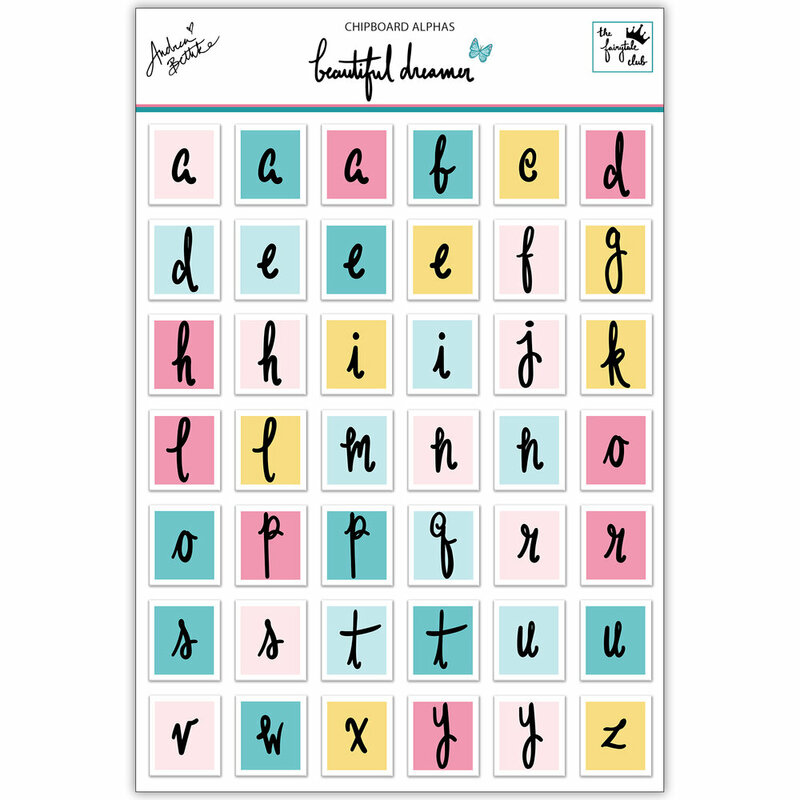 And on the back is a super pretty butterfly pattern which consists of a pink, a yellow and an aqua/teal butterfly. These three butterflies in this pattern are meant to represent the three fairies from the classic Sleeping Beauty fairytale and this, plus the mention of the fairies on the little script excerpt on the front of the pattern, is why the paper is titled the way that it is. This next patterned paper is titled "Her name was Aurora" and it is one of my absolute favorites! It is a gorgeous floral with a light pink background and lots of beautiful and vibrant roses! The roses come in pink, blue and yellow and in various shapes and sizes. On the other side of the patterned paper is a simple but versatile yellow and white diamond pattern. I love this next patterned paper which is called "Be True to You" and is the coolest frame pattern! It consists of four different black and white frames which are repeated all over the page and are just so great -- perfect to use as cut out frames for your pics or you can keep the page as a whole and just cut out one or two of the insides of the frames and place a picture inside for a super sweet 12x12 layout! On the alternate side of the paper is a lovely pink on pink floral which I also love! This patterned paper which is named "Beautiful Dreamer" just like the collection, is also one of my absolute favorites and I super duper love it! I think it may be my favorite pattern to date! It is so, so beautiful! It is a gorgeous floral crest pattern which is reflected up and down and side to side...and it just makes me smile! You will love it! The other side of the paper is a simple but super pretty and versatile black and white geometric which I also love! I can't wait to use both sides of this paper and this is one that I definitely would recommend getting at least a couple of! The next paper is called "Spring Dream" and it is a lovely monochromatic small floral pattern that is a beautiful aqua blue/teal color. I love this one too! I know I am going to use it a lot because it is just so cute! The opposite side of the paper is also way cute and has a sweet little blue bird on it, with a pretty light pink in the background. And this patterned paper which is titled "Once Upon a Dream" is also a huge favorite of mine! And I think you will love it like I do! It is a magical and beautiful castle pattern atop a sweet pink and blue and yellow watercolor background. It is Sleeping Beauty's castle, of course, and it is just so cute! On the back of the patterned paper is a cool aqua blue and white geometric. This paper is named "Believe" and it has an aqua background with a really adorable little unicorn on it...she is hanging out with some little butterfly friends and having a lovely time. On the other side of the patterned paper is a sweet and small pink floral pattern which I love too! Here is one of our cut-apart sheets in the collection. It is called "Make it Pink, Make it Blue!" and it is really, really cute! It has great various sized cut apart pieces, including 3x4 cards and 2x2 cards, labels and even tags! I especially love the little framed castle piece, the little rose tag, and the card that is half pink and half blue and says "make it pink, make it blue" on it! On the back of this cut-apart sheet is a great black and white script pattern which says things like "once upon a dream" and "believe in your dreams" on it. And finally, we have the last paper, our second cut-apart sheet, which is named "Nap Queen". 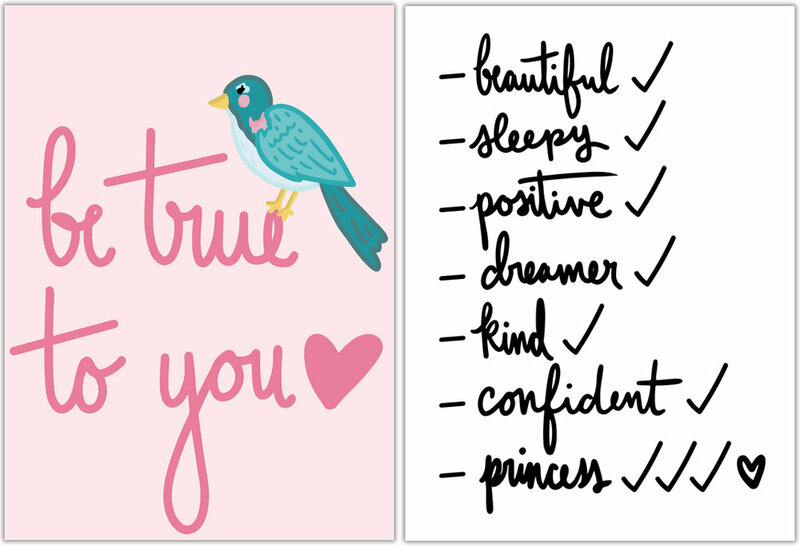 Now, I love all the 3x4 decorative cards that make up this paper, but my faves are probably the one that says "once upon a dream", the cute little bunny with the butterfly, and the card that says "nap queen" on it...oh I love the one with our sleepy princess on it too! She is so beautiful with her golden hair! And on the back of the paper is a super pretty black and white floral pattern which I also love! Okay, now that we have gone through all the 12x12 patterned paper in the collection, let's take a look at the embellishments in "Beautiful Dreamer". First, we have our ephemera pack. Our ephemera packs are always my favorites! And it seems like they are yours too because they are always super duper popular! We always fill our ephemera packs with lots of pretty goodies. Usually, they consist of a lot of different images from the collection, but this time, I decided to do something a little bit different. I created an ephemera pack that was all florals (oh, plus a few other goodies like leaves, a bird, and some butterflies). This was something that go requested over and over again....so many of our customers wanted a pack with nothing but florals in it and so here you go! There are so many beautiful roses in here and I cannot wait to see what you do with this pack! Sometimes you just want a lot of pretty flowers! And don't worry though, about getting all those other cute die-cut images from our collection. I decided to make another kind of ephemera pack which I call, a "variety pack", because it is basically a combination of our normal ephemera packs (with all the various die cut card-stock pieces that come in the collection) PLUS some cool vellum pieces as well PLUS some awesome silver metallic bits as well! YAAAAAY! I absolutely love this variety ephemera pack and I have too many favorites in this pack to name, really. But I will try anyway! So I love the pieces with the princess on it -- the little tag and the framed one! I love the little pink card that says "R is for Rose" on it, the castle piece, the pretty frames, the various script words, and the super cute and pretty floral hearts! The next embellishment in the collection is our sticker sheet. 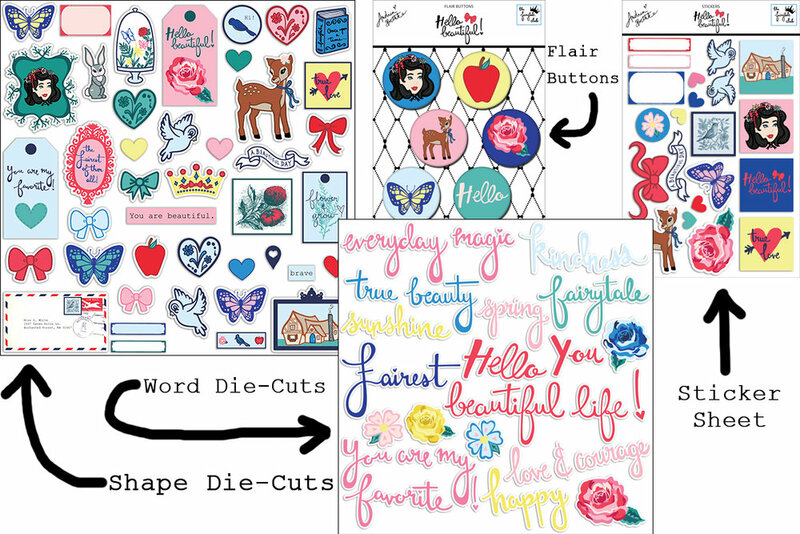 I love these stickers...we have some cute shapes like the butterflies and the castle, but also some really cool word stickers in pink and blue and yellow which say things like "once upon a dream", "adventure", and "everyday magic". And then we have a couple really cool new goodies that we have done special for this collection, which we have never done before! First, there is our all new chipboard letters which I am absolutely in love with! They are so beautiful and charming and fantastic to use! They look so cute on your pages and projects! The letters come in various shades of pink and yellow and aqua and don't worry, you get more than just one of the really common letters, such as a and e and others! And finally, there is this new specialty paper which we are doing which is called "In the Enchanted Forest" and it is absolutely gorgeous! It is like a dream! The paper is so beautiful! 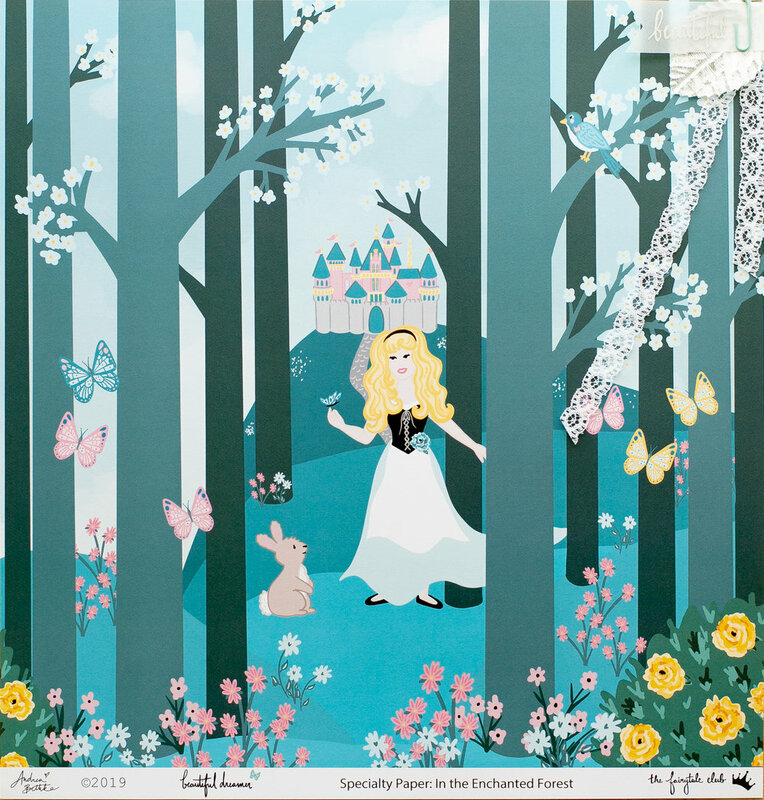 It is an enchanted forest scene with our sleepy and beautiful princess wandering through the forest, with her little fairy/butterfly friends and a sweet little bunny, and the castle off in the distant background. It looks like a beautiful vintage illustration out of a children's fairytale book! Perfect for cutting or you could even frame as is! Oh, and on the specialty paper is some little extra, decorative pieces -- vintage lace ribbon, a silver leaf, and a little vellum tag that says beautiful all papercliped on, so that you can remove them if you wish. And now, let's look at the planner pages that come in "Beautiful Dreamer." Next, one of my favorite dividers, with our beautiful castle on the front and the short story of the inspiration behind this collection on the back. The next divider features a minimalist pastiche of elements from the collection on one side and three differently-colored butterflies on a lovely pink floral background on the other. This next planner page has a simple “sleeping beauty” on one side, and it features our black and white frames on the other, with four pink elements from the collection and the “make it pink!” sentiment. I love this next planner divider as it features my beautiful “dreamer” unicorn along with the sentiment that expresses my life dream. This next planner page is another one of my favorites, with the black and white floral on the watercolor background (which makes an especially good print to put in a simple, white frame) on one side, and the four black and white frames again on the other, this time with four blue elements from the collection and the “make it blue!” sentiment. This next page is both beautiful and useful, with the lovely floral crest from the collection on one side and the classic yellow ledger on the other. I love this next divider which features our sleeping beauty in a simple, teal frame and surrounded by a beautiful, teal, floral background. And finally, here’s another beautiful and useful divider, featuring a growing flower on one side and a month-agnostic calendar on the other with the sleeping beauty castle as the header. As you probably already know, but if you don't here is a little reminder -- we come out with new collections about every month and a half on average (sometimes a little less, sometimes a little more) and they are available for purchase in several different ways. For example, we do have a one time purchase option, but we also have our kit subscription options! Yaaay! And here is a quick review of our kit options: A) Our Scrapbook kit which includes all the 12x12 patterned paper and all the embellishments. B) Our Planner kit which includes all the planner pages (in either A5 size-6x8 or personal size-4x7) and all the embellishments, or C) Our "Happily Ever After" kit which has absolutely everything in the collection -- all the 12x12 patterned paper, all the planner pages, and all the embellishments...plus one or two other goodies that I throw in as a fun surprise! Yaaaay! "Beautiful Dreamer" is available for purchase now on our website! Click here to order and get your "Beautiful Dreamer" kit sent to you asap! Don't miss out! 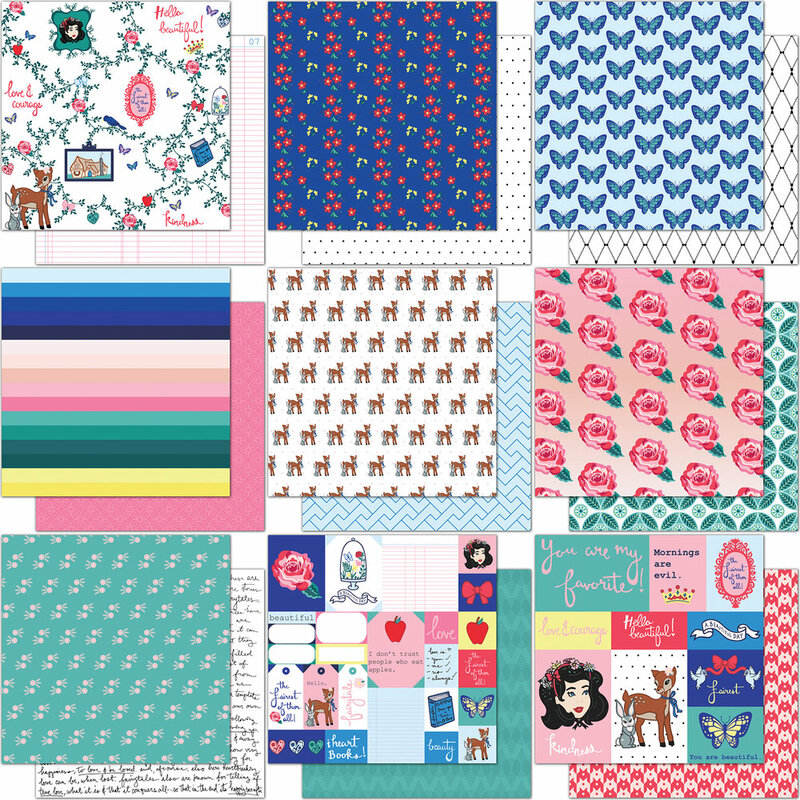 This collection is so very beautiful and, based on the response we got from the Scrapbook Expo (where we debuted it), highly popular, so I have a feeling that it will go fast! I hope you enjoyed this full reveal of our "Beautiful Dreamer" collection. Have a wonderful and magical day and a spring season that is like something you would find "once upon a dream"! Huuugs! "You + Me" Collection Full Reveal!!! Hello there! It's Andrea here, and today I want to share with you a super special new announcement and a new reveal! Are you ready?! Here we go... I have a new collection coming out for Valentine's Day, in collaboration with Johanna Parker! Yay! I'm super excited for this new collection and for the opportunity to collaborate with such a talented, fellow designer! The new collection is called "You + Me," and it is filled with some really beautiful, vintage-inspired designs. If any of you are familiar with Johanna Parker, you know that she is famous for her iconic vintage holiday decor -- you may have seen some of her seasonal decorations just this last Halloween and Christmas at big stores such as HomeGoods, TJ Maxx, or Marshalls or even at beautiful specialty boutiques like Roger's Gardens. I started collecting her home decor pieces a couple of years ago and I love putting them out for the holidays to add that special vintage whimsy to my house! I especially love her Halloween goodies and her super iconic little black, grinning cat that she does!Anyhow, when I heard she was interested in collaborating with other artists, I jumped at the chance to work with her, and I'm so exciting to introduce the first of hopefully several collaborative efforts from the two of us! This new collection, aptly named "You + Me" is an Andrea Bethke and Johanna Parker design effort, and because Johanna and I share a love of vintage goodies and all things whimsical and adorable, we worked together to make something really one of a kind and special for all you guys! Now, this collection is a little different than my regular fair...it is not fairytale inspired and technically it’s not under The Fairytale Club heading, but it's still from me to you, and therefore filled with my style and magic PLUS all of Johanna's as well! This was such a fun combination of both of our styles...there is a little of her classic imagery and design, a little of my pixie dusted artistry and charm, and some really cool ideas that we came up with together! I think you are going to love it! So, let's get started at looking at everything in this new and amazing collection which, may I just add, is absolutely perfect for all your Valentine's Day paper-crafting needs! First, I want to talk to you about the 12x12 patterned paper. The color scheme is a beautiful, traditional pink and red mixed with black and white and a fun splash of aqua. And the patterns in "You + Me" are a combination of the traditional Valentine's Day hearts and flowers plus fun, fresh and trendy imagery like unicorns, balloons, and even some dancing cats and dogs! The first paper here, “You’re Magical,” is one of my favorites from this collection. Can you guess why? Could it be the Valentine unicorns?! Why yes, yes it could be. I am in LOVE with the unicorn, heart, and shooting star pattern, and I also love the ledger print on the other side that is being slowly overtaken by a rising tide of oh so pretty pink! The next paper, “Sweetheart,” is aptly named, as it has a lovely and romantic pattern of hearts of various shapes and designs on one side, and a repeating brush script word pattern on the other reading, “xoxo always sweetie.” I love the use of the traditional Valentine’s Day pinks and reds in this paper! The next pattern, “Luv U,” is another one of my favorites as the front makes use of a very bold, black background behind a confetti shower of different-colored hearts and small pink dots. And on the other side is a fantastic, fun and playful pattern of balloons spelling out L U V in the main colors of this collection - pink, red, and aqua. The next paper, “Darling,” is another one that I adore! The front side is a gorgeous pattern of pink roses on a striking, black background, while on the other side is a large black and white polka dot pattern. I love a good polka dot! This next pattern is so special! It i called "Over the Moon" and it is aptly named! It has a super cute smiling crescent moon with a heart and arrows on one side of the 12x12 and on the other is a very cool happy heart face pattern with various hearts and various fun expressions! This next pattern is called "You + Me" and it may be my absolute favorite in the collection...although I have so many! 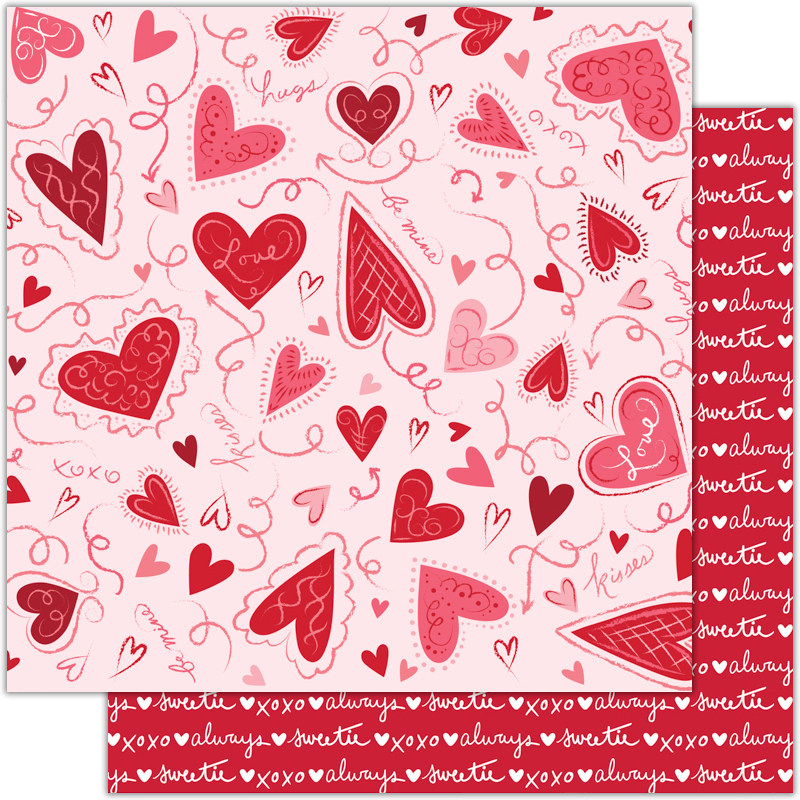 This patterned paper is named for the collection itself and on the front of the 12x12 we have a fantastic and beautiful multi-pattern of various Valentine's Day images...there is a cute little boy and girl in love, some fun conversation hearts, the number 14, and some choice happy heart day words like "kiss me", "cute", "hey sweetie", "xoxo", and of course "happy Valentine's day"! On the opposite side of the page is a simple but versatile aqua geometric. Here we have a really amazing patterned paper called "You're My Favorite" which is also ridiculously adorable! On the front of the page we have a super cute dancing cat and dog pattern...they are clearly celebrating Valentine's Day together! And on the back there is a sweet vintage pink and red pattern that kinda reminds me of stars. And then there are our cut-apart sheets... I always love a good cut-apart sheet! This first one is called "Be Mine" and it is filled with fun goodies to cut out and use for your scrapbooking, planning, cardmaking, home decor...really any of your papercrafting needs! We have 3x4's and 2x2's and tags one one side and on the other is a great aqua monochrome heart pattern. I have a lot of favorites in this cut-apart sheet...but I think I am especially smitten with the cute dancing kitty card and the fabulous BINGO piece! And finally, our last 12x12 is another cut-apart sheet called "xoxo" and it is just chock-ful of 3x4's! I think my faves are the "xoxo" girl and boy cards, the "happy valentine's day" kitty, the crescent moon and the lovebirds! Oh...I love the "You + Me" card too! Okay, okay...I may love them all...lol! And on the back of the 12x12 is a simple and versatile black and white stripe which is just bold and beautiful! Alright, now that we have gone over the patterned papers in the collection, I think we should switch gears and take a look at the gorgeous embellishments that come in "You + Me"...such as our ephemera pack. I love ephemera, don't you?! It is just so great for so many things! And this ephemera pack is spectacular! It is filled with love and magic and vintage whimsy! There are tons of hearts -- heart faces, conversation hearts, lacey hearts, love-y hearts, other decorative hearts...both big and small! We definitely have you covered in the heart department! 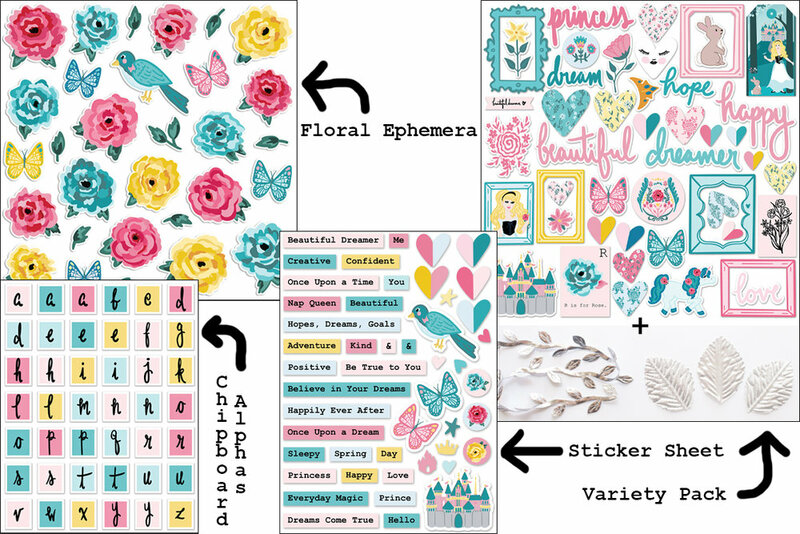 And there are so many other beautiful die-cuts in this epherma pack that you are just going to love! I especially love the big-eyed pink haired girl with the little Valentine hat, the beautiful rose, and the two adorable lady bugs! And next, let's talk about the sweet sticker sheet that comes in the "You + Me" collection. We have several conversation hearts that say things like "sweet", "dear" and "be mine". There are other hearts of course and an arrow too. And we also have little label words and brushscript words that say things like "huuugs" and "always" and "love". 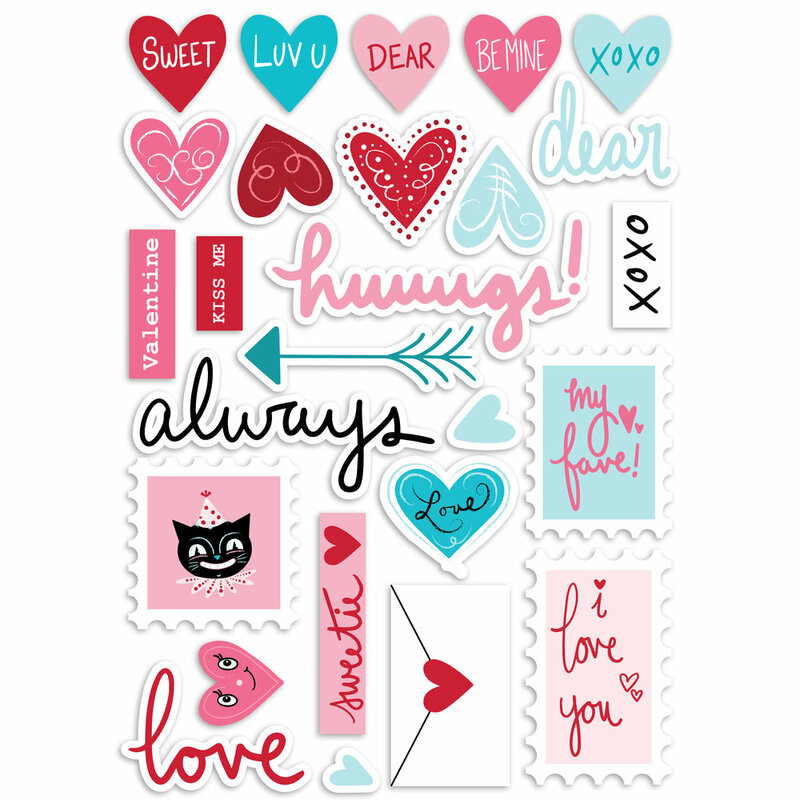 PLUS there are some really amazing postage stamp sitckers which are super cool and perfect to place on your Valentine's Day card envelopes! I think my fave though might be that adorable and simple little envelope sticker...it's just too cute! And next is our stationary pack. I love this pack of goodies! It has some really amazing pieces in it that are so cool and intricate! I love the Valentine's Day cards like the lovebirds card with the scallop, the "You + Me" boy and girl card, and the "happy Valentine's Day" card with the smiley black cat! I also love the cute decorative tags, especially the cut out "xoxo" one! But my favorite thing in the pack might bee the fabulous little picture frames which are just perfect for a photo of you and the one you love! Alright, now that we have looked at all the 12x12 patterned papers in the collection, and all the different embellishments in the collection, aren't we missing something?...oh, that's right, the ridiculously beautiful and adorable and magical decorative planner pages that come in the collection! These come in a 6x8.25 size, perfect for a planner, but they can also be used for a mini album, a traditional scrapbook, a banner, some cards, to frame and put up as decoration...really, I have seen our customers use these gorgeous pages for so many things, and they always look fabulous! First, let's look at this planner page with the quote on it "I will love you..." It reads, "I will love you my dear and oh so sweet, sweetheart, forever and always, and then some more after that!" I love that! It is so true and so beautiful! And it's visually pleasing too as a pretty, monochromatic aqua on aqua. And on the other side of the page is a lovely pink rose, and it says "always". Next we have a planner page that is definitely a favorite of mine! I just love that dancing, vintage kitty and puppy (so iconic of JP by the way)! And on the other side, a pretty pink and red quote that says "will you be mine, sweet Valentine?". This next page is anothe one of my favorites! I love both sides so much! The lovebirds are so sweet! And on the other side is our big and bright eyed Valentine girl...and she is covered in hearts -- on her hat, on her collar, her dress, her cheek and even in her eyes! She is in love for sure! The next planner page has a wide-eyed kitty completely decked out for Valentine’s Day, with a heart collar, hearts on her back and belly, and sporting a “Happy Valentine’s Day!” message. And hearts for eyes, too! And on the other side is the beautiful script word “Love” in front of a heart. This next planner page is another one of my favorites because it features two extremely cute lady bugs in the JP style with the “Be Mine” Valentine’s Day message on one side and a framed heart face with an awesome black and white stripe background on the other. I love this next planner page because of the amazing moon with heart and arrows graphic on the one side. The moon is one of my favorite designs in this collection and is perfectly iconic of the JP style. The other side is also great for the “February 14th” graphic. Now, I know I say this about a lot of the paper, but this next planner might actually be my favorite. I love the Valentine’s Day girl and boy in love sooo much, and this design is also the inspiration for the title of the collection - “You + Me.” And the back with its calendar is both beautiful and functional. I love it! And finally we have the fabulous L U V balloons planner page with the amazing red unicorn on the other side. Well, I guess that’s it! I am really in love with the collection, and I hope you are, too, at this point. It is so playful and whimsical! It was a great experience collaborating with Johanna Parker, and I’m looking forward to doing it again soon. This collection is available to purchase now, so head on over to the kit shop page and get yours today! "Practically Perfect" Collection Full Reveal!!! Hello everyone! It's me, Andrea, here today and I want to share with you our full reveal of our new and oh so exciting collection, "Practically Perfect"!!! I am just thrilled about this collection! I think it is my favorite to date and I just had the best time designing it and creating all this for you guys! I really, really love it and I think you guys are going to too! So first of all, let's talk about the collection as a whole and what I was inspired by. I think that by looking at "Practically Perfect" you can probably tell the inspiration behind it... I am always inspired by fairytales and the story of Mary Poppins is definitely one of my faves and so when I heard that Disney was going to be creating a sequel to the original classic, I knew that doing a collection/kit based on these two stories of Mary, the old and the new, was just something that I absolutely had to do! To that end, I tried to create "Practically Perfect" in such a way that paid homage to some of the most iconic and special images and ideas put forth in the original Disney movie, as well as adding in lots of goodies that were inspired by their new look at Mary. I think you can see this in pieces like the carousel, Mary's lavender carousel horse, and the spoon filled with sugar, which are clearly inspired by the original classic, and then pieces like Big Ben and Mary's new red and blue outfit and her cute little hat with the birdy on top, which are all inspired by the new Mary Poppins Returns movie. I designed this collection to really be a happy combination of old and new -- to have those ideas and images that are inspired by our memory of who Mary is, while also incorporating ideas and images inspired by our new, modern day Mary. Alright, now that we have talked a bit about inspiration for the collection/kit, let's look at the super lovely and, if I may say, pretty perfect patterns that are in "Practically Perfect" and also it's overall feel and color-scheme. So the color-scheme for this collection was really inspired a little bit more by the new Mary movie than the old one. I liked the combo of the bold reds along with the dark blues mixed in with light pink and lavender and yellow. These colors don't necessarily feel like they would all go together, but they really do and they create a very sophisticated, modern and magical feel! The patterns that we did in this collection are super cute and really beautiful and definitely very vintage! You all know by now how much I love vintage and since the first Mary is set at the very end of the Victorian era, and the second Mary is set in the mid 1930's, I definitely had to bring on the vintage goodness! I decided to lean a little bit older vintage than what I usually do (since my style tends to be a little bit more retro, 50's and 60's vintage) and I also wanted to make it feel modern though and very chic and now! I think that we ended up marrying those things well with the patterns that we created and I am excited to look at each of them with you! Alright, so let's look at one of my absolute favorite 12x12 patterned papers in this collection, which is the "Jolly Holiday" pattern. This pattern is so fabulous and beautiful! I love the multi-colored floral that is on the front and the cute black and white pattern on the back with the flying Mary silhouettes is amazing too! Both sides seem very classic Mary, but also fresh and modern too and they have that magical, vintage vibe that you will find throughout the collection. This patterned paper just makes me smile! The next patterned paper here, is called "Let's Go Fly A Kite" and it has got a really cute patched up, home-made kite on the front with a cool "votes for women" tail hanging from it as it flies in the air against a lovely light blue background. On the back of the paper is a really classy looking vintage pattern in dark blue and red which looks like something you would find on a bowtie. Another really cool patterned paper in the collection is called "The London Sky" and it is very modern and amazing looking! It has all the different colors of the collection in it, all as part of this great triangle mosaic kind of thing and it is so fun and vibrant, I love it! On the back is also a really awesome pattern - a classic polkadot pattern with Big Ben on top. It is super cute and I would say that both sides remind me of London...like classic London and modern London mixed together. This next 12x12 paper is called "Carousel" and it is inspired by Mary's pretty lavender carousel horse. I always loved the scene in the Jolly Holiday sequence from the original movie, when Mary and Burt and Michael and Jane all ride on carousel horses across the English countryside and even into a big race! It is so cute and because I love carousel horses so much just in general too, I had to include a little, pretty carousel horse pattern in this collection! On the back of the page is just a real pretty and simple little pink floral pattern that I think matches nicely with the girly, feel of the carousel and the English countryside scene. This patterned paper, which is the namesake of the collection, "Practically Perfect", is also one of my absolute favorites! As you can see, it has a super cute, magical and proper English nanny on the front. My pretty-much-perfect Mary gal here has got her beautiful vintage red suit on, her fabulous hat, her classic, talking parrot umbrella, and her handsome polka-dot bowtie...oh, plus a new bottomless bag of tricks! She is super adorable and I just love her! On the back of the patterned paper, is just a great, simple and versatile red chevron print that kinda reminds me of the red chevron on Mary's red suit in the movie. Alright, my next 12x12 patterned paper is called "A Robin". I wanted to do this little birdy in this collection to both go on the hat (and be reminiscent of Mary's cool new hat in the new movie), but I also wanted to place it on a branch in other situations like with this print, so that it could also pay homage to the little blue Robin that Mary sings with in the original movie during the "Spoonful of Sugar" scene. On the back is a cool and classic, vintage yellow pattern that is definitely reminiscent of the 1930's. This patterned paper, named "The Cover Is Not The Book", has a really soft and pretty pink and lavender vintage fan pattern on the front. I was inspired by the new song from "Mary Poppins Returns" and the pretty pinks and lavenders that she wears in that scene. It is definitely a very vintage feeling pattern and I think it adds a lot of whimsy to the collection. On the back is just a super classic pink and white stripe, which was also inspired by the "Royal Dalton" adventure in the movie and the pink and white striped dress that she wears right before she changes into her pink and lavender look. Here we have my "Mary" patterned paper...which is so amazing and really inspired by the two sides of Mary's personality! There is a lovely and big, bold, pink rose floral patterned paper on the front. It is very beautiful and sweet and magical! And this rose pattern has a kind of painted/drawn look to it, which reminds me of both the chalk, "Jolly Holiday" scene in the original Mary and also of the painted "Royal Dalton" scene in the new Mary. And then on the back of this really beautiful and soft rose pattern, is a very handsome and sharp geometric. This pattern reminds me of Mary's various suits and coats and bowties and such that she wears in both movies. The two patterns work well together because they have this nice contrast and they kinda show the two different sides of Mary and how she dresses and represents herself -- sometimes very prim and proper and strict, and other times much softer and sweeter and more whimsical. And finally, here we have our two cut-apart sheets in the collection. The first cut-apart sheet is called "Supercalifragilistic" and it has got lots of great 3x4 decorative cards on it that you can cut out and use in pocket pages, for cards, to tuck into your planner, etc. I especially enjoy that "The Cover is Not the Book" card and also my sweet little penguins card and definitely the pretty "Jolly Holiday" carousel card! On the back is a sweet and simple red gingham pattern. The second cut-apart sheet is called "Anything Is Possible" and it has lots of different, great and useful pieces in various sizes and shapes. There are 3x4's and 2x2's, tags and labels...lots of good stuff! I particularly love the "Practically Perfect" ruler card, the "Anything is Possible" half and half card, and really all the sweet little 2x2s! On the back is a cool burgundy and navy and white geometric. Ok, now that we have gone over the patterned papers in the collection, let's now look at the embellishments in "Practically Perfect". I am loving all the cool embellishments in this kit/collection! We, of course,have our classic ephemera pack which is so popular with our customers! We really filled it to the brim this time too with sooooo many goodies! I just went a little crazy, making lots of fun different pieces for you guys for this ephemera pack! You will find in the pack, really awesome pieces like the red Mary silhouette card that is in there, which is one of my faves, lots of really gorgeous florals which are also my favorites, some cute little bowties and different umbrellas, a really pretty Mary cameo which I love, my super duper pretty carousel which I also love, a "trip the light fantastic" tag and so much more! Oh and there are some great script word pieces in there too which are also my fave! It is pretty much all my favorite, to be honest! In addition to our ephemera pack, we also decided to make a sticker pack for this collection. We haven't done stickers in our collections/kits in some time now and so I was excited to do some again! And this sticker sheet is fantastic! It has some little script words and images like balloons and florals but the two things that I like most about this sticker sheet is all the small label word stickers that we did in the various colors of the collection, and also the cool postage stamp stickers that we did like the umbrella and the Mary silhouette! Another fabulous embellishment in this collection is our flair button pack. I love our flair buttons! They are so cute and they make great dimensional additions to your page, card, planner, etc and I also love to use them to create pretty decorative paperclips with! This set is definitely one of my faves for sure because I love the little penguin button and the cameo button especially! Okay, now let's talk about the super duper cool and beautiful new embellishment that we are doing for the first time in this collection, and that is our stationary pack! We have never done a pack like this before and I am so so happy about it and I'm so excited to see how you guys like it and what you do with it! In the stationary pack we have lots of cool big stationary pieces for you, some of which are die-cut into! We have a polkadot tag that has the word "Wonder" cut out of it, a 3x4 Mary silhouette patterned card that has a big red heart cut out of it, a big pink square card that has the word "Supercalifragilistic" cut out of it, and a striped tag that has a little umbrella cut out of it! We have other cool tags and labels and cards and things in the pack too , including some added fun, dimensional goodies like a fun pink tassel and a yellow pom-pom paperclip! This pack is great and perfect for snail mail, scrapbooking, cardmaking, planning, etc!!! And finally, let's look at our transparency sheet that comes in the collection. It is also technically one of our embellishments and I love it so much! We chose to make this transparency gold Mary silhouettes on one side, and dark blue on the other! So pretty on both sides and perfect to make cute things like shaker pockets with, adding a little shiny special something to your layout or your Project Life pocket page, or to make a planner dashboard with! I think it would also be nice to make a folder page out of or even a pocket/envelope to tuck goodies into! Now, let's look real quick at all our beautiful planner pages that come in "Practically Perfect". We always have the prettiest decorative planner pages in all our kits/collections and they come in both A5 and personal sizes. First, we have our Mary planner page with our Mary in her cute red suit and lovely polkadots behind her. And on the back, a big bold red page with "Supercalifragilistic" printed on it in a very modern, cool way! Next, we have our adorable little, playful penguins. I do so love the penguins that Mary dances with in both the movies and I had to do my own take on them, but I decided a little penguin girl was in order...cuz not all penguins are boys after all! On the back is a little kite silhouette and the words "lets go fly a kite". Here is another Kite inspired planner page and on the front is our homemade kite in green with the little patches on it and the "votes for women" tail. And on the back just a simple red gingham. Next is a super pretty and whimsical planner page which has the quote "Never Lose Your Childlike Sense Of Wonder" on one side, and the gorgeous Jolly Holiday carousel on the back. This next planner page is one of my favorites and it has our beautiful multi-colored floral pattern on the front with my Mary silhouette on it and on the back is a simple and versatile ledger. So awesome! Alright, next is my little Robin birdy on the branch and then on the back is just a cool yellow geometric. Very lovely! Here is our carousel horsey in lavender, with her lovely floral detailing on her, and her sassy little smirk...so cute! And on the back is just a simple pink floral. Next we have our "Practically Perfect" planner page in a pretty, monochromatic blue on blue. And on the back is a very Victorian looking black and white spoonful of sugar! And finally we have this fabulous Big Ben planner page that has the iconic London clock-tower on the front with the flying Mary silhouette pattern in the background and you will notice one of my Mary's is highlighted in red! This may be my favorite planner page in the collection! And on the back it says "Anything is Possible" and that is so true!!! Love it!!! Alright, that's all! I hope you have enjoyed this full reveal of our newest collection, "Practically Perfect"! I absolutely love this collection/kit!!! It is so, so magical and wonderful and filled to the brim with beauty and creativity and imagination!!! I really had the best time making this for you and I really hope you enjoy it! Subscribe today and make sure you get this collection/kit and our future ones as well! You can subscribe for 6 kits in a row or 12! Or you can also do a one time purchase! Subscription is already available right now so you can sign up for that today and make certain you get this kit, and then availability for one time purchase will start tomorrow. The kit options we have available are our "Scrapbook kit" which comes with everything in the collection except for the planner pages, the "Planner kit" which comes with everything in the collection except for the 12x12 patterned papers, and the "Happily Ever After kit" which comes with absolutely everything in the collection plus a little something extra! Check out our subscription options on our website for pricing. Okay, I think we are done for now. Hope you think that this new collection is as magical and "Practically Perfect" as I do! Huuuuugs everyone! And remember, anything is possible when you live your life as a fairytale! Fairytale Christmas Workshop Special Event Kit, "Christmas-land," Full Reveal!!! Hello there everyone! It’s Andrea here, and today I want to share with you the full reveal of our beautiful new specialty kit “Christmas-land,” which we have made special for our Fairytale Christmas Workshop to be held this Friday, the 21st (tickets still available)! It is such an amazing kit and just filled with the cutest, vintage-retro, Disney Christmas designs! I don’t know about you, but I love Disney, especially Disney at Christmas-time!!! There is so much Christmas-y goodness in this collection, and I can’t wait to show it all to you! First, let’s talk about what the kit was inspired by and what it is all about. Whenever we have a special event, we do a special kit that is specifically made and themed for the event and the projects that goes with that event/class. In the past we have held our events at Disneyland, and, focusing on a particular Disney theme, they are always filled with Disney magic! For example, the theme for our most recent event was “The Wonderful World of Disney,” which was about vintage Disney and the opening of Disneyland in 1955. While this event isn’t happening at Disneyland, it is all about Disney at Christmas-time, and is therefore chock-full of that Disney magic! You’ll find loads of Christmas imagery but with a Disney spin, like our Mickey ears-wearing Santa, the Mickey ears wreath, our gingerbread mouse, and our festive Small World facade, just to name a few! For more examples, just below you can see a quick overview of the awesome embellishments in the kit (we’ll take a closer look later on)! But first, let's take a look at all of the beautiful patterned papers in the kit. As you can see, the color scheme for this collection is composed of traditional Christmas reds and greens, combined with lovely pinks and blues, which reflects the colors you’ll actually see in the parks this time of year. This color scheme helps evoke the vintage-retro feeling I always get when I think about Disney, especially at Christmas-time. This vintage-retro vibe especially comes through in the types of patterns in the collection, not just the colors. I love how the patterns came out in this collection. They are super duper cute! And oh so vintage Disney! Let’s talk about my favorites (it’s all of them). To start us off, we have the paper below, appropriately called, “Christmas-land." If you look closely on the front side, you’ll see the tops of the towers of the castle are covered in snow! I love that little detail! And on the back is an awesomely retro, geometric, tear-drop kind of pattern. The next paper, cheekily titled “Do Ya Wanna Build a Snowmouse?”, is also one of my favorites (as I said earlier). Our little snowmouse on the front is so cute, don’t you think? And on the back is a Christmas stripe, perfect to use as a background for any of your Christmas projects. The next paper, called “Holly Jolly,” features rows of cute, snow-covered houses, which, I have to say, look extremely cozy and inviting on the inside. And on the back is a familiar, festive script with a Disney twist, reading “have a holly jolly Disney.” I just love it! This next paper really is one of my favorite favorites! It’s aptly titled “Gingerbread Mouse,” and it features the absolutely cutest gingerbread creation you’ll ever see, flanked, of course, by delicious candy canes. And on the back is a simple black bow pattern, with a lovely soft blue background. The next paper, called “Christmas Mouse Club,” is obviously another one of my top picks, and you know this is true because we brought back a pattern from our last Disney collection and gave it a Christmas colors update. I love how the whole thing pops now! And on the back is a really neat, retro, circle pattern. We’ve had a bit of fun with the name for the next paper: “Under the Mouseletoe.” ;-) Our retro Minnie and Mickey are poised and ready to smooch under that famous little plant. And on the back we have a clean and simple mistletoe and Christmas bells pattern, very much like the kind of cute wrapping paper you’d find back in the day. “Holiday Cheer” is the name of our next paper, and it features a cute, Mickey head ornament on the front. The back though, has to be one of my absolute favorite patterns from this collection. Those two, cute reindeer in pink and blue are obviously smitten with each other (you can tell by the heart hovering between them). To wrap up our review of the papers in this collection, let’s take a look at the cut-aparts. There is the first one, called “Christmas at the Park,” and the second one, called “All I Want for Christmas is a Castle!” They are filled with fabulous vintage Christmas images like my cute, ginger, Mouseketeer girl, the Christmas tree with the mickey head ornaments, the Sleeping Beauty castle with the snow-covered towers, the Disney Christmas stocking, Small World for Christmas, and vintage-retro Mickey and Minnie of course! And they each have some really pretty vintage-retro patterns on the back of them as well! Alright, now that we have looked at the pretty patterned papers in the collection, let’s take a look at the embellishments in “Christmas-land,” as promised earlier. This collection has a few really cute embellishments in it. one of which is the ephemera pack. It has some really amazing bits and pieces in it, like my cute little Mickey ears hats, Disney Christmas stockings, and cool script words like “santa” and “Merry Christmas.” And that’s just to name a few! These decorative pom-pom paperclips are an embellishment we’ve started including in the past few kits. This pack is slightly different, though (I think for the better! ), in that these pom poms are 1” instead of 1.5”, and you get six instead of four. They are great to use as a statement piece on your project or layout and absolutely perfect for planners, mini albums, and December daily’s to highlight or mark your spot on specific pages. I love how the pom pom colors work perfectly with the rest of the collection, and the gold paperclips are a very elegant finishing touch. Here we have our final embellishment pack for this collection! It’s another one we started including in our kits very recently. The response was very positive, so we decided to do it again, especially since this kind of variety pack works well for the workshop this collection was designed for. But honestly, the bits and pieces you’re getting in this pack will work really well in any Christmas project you happen to be working on. You get six buttons, three glitter star stickers, ten bells in various sizes, and a very healthy amount of awesome Christmas sequins. Not to mention the library card and holder back there! I really love how this variety pack turned out! And finally, let’s return to paper and talk about the gorgeous planner divider pages that come in “Christmas-land!” In addition to featuring many of the amazing graphics we’ve talked about already, there are three pages with one side dedicated to taking notes/making lists for Christmas and one page with a side containing a cute, December calendar! Let’s take a look at each planner divider individually. We begin with one of my favorites, my cute snowmouse! He looks so dapper in that red and blue scarf! And I love the expression at the top, “It’s a marshmallow world in the winter!” And on the back is a lined page perfect for writing down your favorite memories from this holiday season. On this next planner page, we return to the Small World facade design originally feature in “The Wonderful World of Disney” collection, only it’s been given a “paint job,” if you will, for the Christmas season! And there’s another lined page on the back for writing down your holiday traditions. Perfect! We continue with a divider featuring the Mickey ears Christmas wreath and a “Joy to the World” sentiment on the front, and that incredibly cute, blue reindeer design on the back. I just can’t get over the cuteness! I love this phrase divider with the snow-covered Sleeping Beauty castle on the front. The sentiment on the back is a perfect encapsulation of what Christmas (especially a Disney Christmas) means to me. Here we finally get to see the gingerbread mouse in all his glory! He’s just SO happy to see you! (Don’t tell him he’s about to get eaten all up!) And on the back is a collection of adorable, Christmas-themed Minnie ears. Speaking of which, don’t forget to order your Fairytale ears today (not just for Halloween or Christmas)! This next planner divider is great because the sentiment on the back, “I love Disney at Christmas-time,” is pretty much the inspiration for the whole collection in one, simple sentence. And how cute is my redhead mouseketeer on the front? She’s so ready for Christmas! Last but not least we have the planner page I mentioned earlier with the December calendar on the back. It’s great because it’s not pre-filled with any dates or years, so you can use it now, or you can save it for next year or the next or the next or…you get it. And of course, on the front we have my super-cute, psyched-for-Disney-Christmas Santa, sporting his mouseketeer hat on top of his Santa hat!!! Makes you wonder, is that hat just a part of his head at this point? Alright, so that’s it for this reveal of the new “Christmas-land” collection. I hope you enjoyed it and are as excited about it and in love with it as I am! Of course we would love to see you at the class on Friday (you can still get tickets! ), which includes this kit, but even if you can’t make it, you can still join the fun - the collection is up for sale now! Talk to you later everyone! "December Dreams" Collection Full Reveal!!! Hello there everyone! It is Andrea here and today I am super excited to share with you the full reveal of our newest collection, "December Dreams"! This beautiful Christmas collection is inspired by the new The Nutcracker and the Four Realms movie by Disney, as well as the classic The Nutcracker fairytale ballet! The Nutcracker is a classic Christmas tale that is filled with magic and wonder! Subsequently, I just had to create a collection for you that was filled with that same kind of magic and wonder! To accomplish this, I worked to design patterns and images that I hoped would convey not only the central story of The Nutcracker but also images and patterns that reflect the main characters and, of course, the magical and imaginative lands that can be found in the fairytale. In "December Dreams" you will find fantastic, whimsical beings like the Sugar Plum Fairy and the Nutcracker, of course! You will also find lots of sweet goodies in this collection, like gingerbread men and houses, lollipops, peppermints, etc, which are all indicative of one of the four realms, the Land of Sweets! The other magical lands, or realms, in The Nutcracker are also included in the collection in various ways. For example, you will find lots of snowflakes in patterns as well as embellishments to represent the Land of Snowflakes. I really want "December Dreams" to feel like that same kind of winter wonderland that can be found in The Nutcracker...something so incredible that it must be from a dream! I am so happy to be able to share this collection with you! I think you are going to love it! I know I do! Alright, now that I have talked a tiny bit about the inspiration for this collection, I want to go over the patterned paper that comes in "December Dreams" with you. First, let's look at the color scheme that is in the papers/collection. The colors in this collection include the classic Christmas colors of red and green, but I have also added in some other very pretty and happy colors like light pinks, some light and dark aquas, and even a little bit of lavender...all to create a cool, retro vibe. The patterned papers in “December Dreams” are really beautiful and magical, and they tell the classic story of The Nutcracker. And, as I go over each patterned paper with you, you’ll probably be able to see how the story comes to life in this collection and why I love it so much. So, for this first pattern, entitled “Land of Snowflakes,” we have a bold aqua on white snowflake pattern on the front and a lovely and large red scallop on the back. Both have a “modern meets retro” feel about them, and they express the happy and whimsical nature of the Land of Snowflakes. This next paper is called “Clara” after the main character in The Nutcracker ballet. She is a young and beautiful girl who embarks on a dreamlike adventure in a new and amazing world at Christmas time. With this paper I wanted to convey the elegance and sweet innocence of the young lady that is Clara. For the front I created a beautiful black and white pattern of two swans. Both the black and white swans are princesses, wear lovely crowns, and are symbolic of royalty. Since Clara is the rightful ruler of the four realms (as her mother created the realms in Disney’s new version of the story), I thought this would be appropriate. On the back you will find a simple but elegant and pretty pink on pink geometric pattern that I also feel fits well with the girlishness of Clara. Our next patterned paper is “O Christmas Tree.” On the front of this paper we have a super cute Christmas tree pattern. The tree itself is trimmed with lots of pretty ornaments and other decorations such as candy canes, with of course the traditional star atop it. I chose to do this Christmas tree pattern to represent the large tree that grows at the beginning of the traditional Nutcracker ballet. On the back of the paper I chose to do a sweet, little reindeer pattern. I love and collect deer (especially vintage ones, and especially at Christmas time), and I just felt that the addition of some deer in this Christmas collection was a necessity. I mean, who doesn’t like deer?! For this next paper, which I have named "The Nutcracker" (for fairly obvious reasons), we have a plethora of Nutcrackers standing at attention in a row, all lined up and ready to serve their duty in the fight against the Rat King...or Mother Ginger as the case may be...depending on which version of The Nutcracker you are watching, the classic, or Disney's new retelling. Either way, this pattern has a whole lot of handsome Nutcrackers all in a row! I love the look of them! And on the back there is a cool, retro looking blue on blue pattern, which is very versatile and useful. “Land of Sweets” is our next patterned paper, and it’s one of my favorites in this collection! I love all the cute little gingerbread men! In addition to the gingerbread men, there are lollipops and peppermints, and this fun and happy pattern just perfectly conveys the silly and whimsical feeling that can be found in the land of sweets. On the back is a super useful ledger that is perfect for any Christmas time journaling that you might want to do. This next patterned paper is called “Sugar Plum Fairy.” It’s an explosion of candy and confetti and color, and it is meant to represent the ethereal exuberance of one of my favorite characters in The Nutcracker, the Sugar Plum Fairy herself. On the back we have a retro diamond pattern in a pink, red, and purple color scheme, which is also reminiscent of the Sugar Plum Fairy - her sweetness, her effervescence, and her bold but ladylike demeanor. Here we have “December Dreams,” named for the collection. I wanted to do a patterned paper that was a December calendar for several reasons. A calendar like this is so incredibly useful and versatile because you can use it for so many Christmas-time crafts! It is perfect to use to make an advent calendar (to countdown the days to Christmas), perfect to use for your December planner (to mark your plans for the holidays), and also, of course, perfect to use for your December Daily (to document the days of December in a special, keepsake scrapbook). Whether you cut the paper up into squares, or leave it all in one piece, this patterned paper is so cute and so perfect to create with! I have also included a few fun little squares with images from the lands of sweets and snowflakes on them, as well as a christmas message. Plus, as a fun and special added detail to this December calendar paper, each calendar day square has a little word at the bottom, all of which are words of the season! 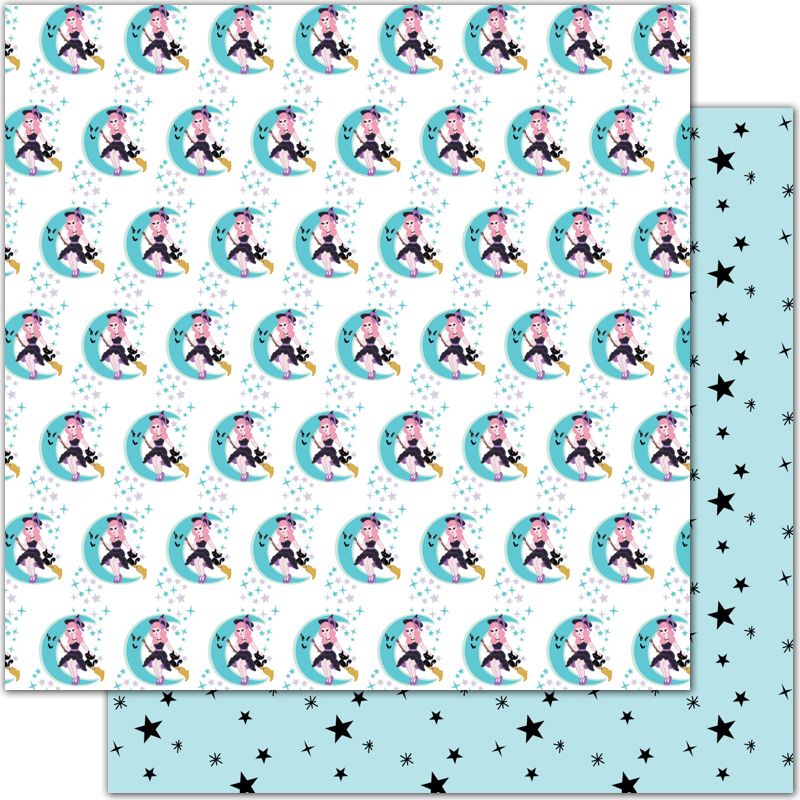 On the back of the paper you will find a fun, retro, mid-century modern diamond pattern in aqua. I love the aqua blue and white color-scheme and the light and airy feeling that it has to it. It kind of reminds me of snow falling. This next patterned paper is called "Land of Flowers," and it is a very pretty and sweet little vintage floral print on the front and a cute and simple little pink on red, vintage pattern on the back. Both sides are very girly and feel like patterns that you might find on some old, vintage, fat-quarter fabric that your grandma would use to make a comfy quilt. Or, at least, that is what they remind me of! Either that or maybe some fabric your grandma used to make you a sweet little dress? The point is, they have a very lovely, vintage fabric feel to them, something you might find among grandma's fabric collection, and I absolutely love that about this paper! This patterned paper is simple, but oh so versatile, and definitely one of my faves! Now let’s look at the cutapart sheets. Our first cutapart is called “The Fourth Realm.” In this cutapart, we have several different sizes of cute, cutapart goodies. We have several 3x4 cards, several 2x2 cards, some awesome tags and labels, plus more! There’s so much to love about this cutapart sheet, but some of my favorite pieces are the sweet, little, gingerbread man, my beautiful and magical Sugar Plum Fairy, the elegant swan, the mysterious owl, and the adorable gingerbread house. On the back of the cutapart sheet we have a pretty red on white bow pattern that I am in love with as well. The next cutapart is called, “Key to the Kingdom,” and it has mainly 3x4 cards on it. There are lots of cool, decorative 3x4 cards on this cutapart sheet, such as the “Merry Christmas” card, the sweet, little cupcake, my adorable “tree-cup,” and my check list for the season. However, this paper is named for the pattern on the back, which has the golden key to the Four Realms on it. So cool! Alright, now that we have looked at all of the beautiful, patterned papers in this collection, let’s now talk about the awesome embellishments that come in "December Dreams." First, let's start with our ephemera pack. We always do an ephemera pack for our collections/kits because I absolutely love ephemera, and obviously so do all of you because our ephemera packs are super popular and our best sellers...yay! And I think our ephemera packs are so loved because they just always have so many super cute and useful pieces inside them. We fill our packs with as many die cut pieces as possible. We really have fun creating these ephemera packs for you and creating lots of adorable little pieces that you can use to embellish your paper crafting projects, and so of course this time was no different. I filled the ephemera pack for “December Dreams” up with lots of beautiful imagery from The Nutcracker that I thought helped to convey the magic of not just that fairytale, but of Christmas itself. There are a lot of really cute and, of course, vintage inspired and whimsical pieces in this pack. Some of my favorites include my Sugar Plum Fairy ballerina, my various sweets and gingerbread men, my Merry sign with the wreath around it, the gingerbread house, the Nutcracker and Nutcracker poster, and so many more pieces! This next embellishment in our “December Dreams” collection is our decorative paperclips. These paperclips are fuzzy and adorable, and they come in a few different Christmas colors that match perfectly with the colors in our collection. They are great to use as a statement piece on your project or layout and absolutely perfect for planners, mini albums, and December daily’s to highlight or mark your spot on specific pages. Now I want to talk to you about a really fun new embellishment that we’ve decided to do for our “December Dreams” collection. I wanted to try something different, so I decided to create our “variety pack.” I had the idea to put together a grouping of various items that I thought helped to convey the fairytale story that the collection was inspired by. In the case of “December Dreams,” I put together very specific and iconic pieces for The Nutcracker inspiration. So, included in this pack you will find things such as various snowflakes and Clara’s golden key to the Four Realms, as well as other goodies. I’m so excited about our new “variety pack.” The concept is really fun and cool, the pieces in the pack add a lot of dimension and texture to your papercrafting projects, and I’m excited to do different ones in the future that will depend on what the collection is. Alright, now that we have looked at all the amazing embellishments and patterned papers in "December Dreams," let's now look at our glorious Planner pages! I love these Planner pages, they are sooooo cute! And they are perfect for so many papercrafting projects...in addition to of course being perfect as your planner dividers! These pages come in both 6x8 and 4x7 sizes and they work great not only for ringed planners and Traveler's Notebooks, but also for other papercrafting things like cards, banners, and mini-albums, and they are great for framing and decorating with, too! Plus, if you are creating a December Daily this year, or any such December/Christmas documented album, these pages are absolutely ideal! I myself like to create what I refer to as a "Holidaily" each year at this time to document each day of the holiday season, and I love using our decorative 6x8 planner pages for that project because they are perfect for it! Let’s now take a look at each of the planner pages individually. First we have our Christmas tree planner page. This cute, retro tree has a bit of a shabby chic look to it, and it’s so pretty, with all the little peppermints and lollipops on it! This planner page has our gorgeous Sugar Plum Fairy on it. As you can see, I was inspired by the Sugar Plum Fairy in the new Disney version, played by Keira Knightley. I love her big, pink cotton candy hair, and her multi-ruffled dress. I did take some liberties though, adding in ballet shoes and, of course, wings…’cause what is a fairy without her wings!?!? This next planner page has our majestic Nutcracker on it. He is the hero of the classic Nutcracker ballet story, and so I had to include him as a main staple of our collection, and to feature him on one of our planner pages. Doesn’t he look so handsome!?! This planner page is one of my favorites. I absolutely love this super adorable gingerbread house. It is too cute for words, with its blue icing and pink doors. I just want to eat it up! This swan planner page is also a big favorite of mine. These two swans are just too pretty, and I love the border with the crossed keys, too. This Christmas quote planner page is a good reminder of what this season is all about. Here we have our gingerbread man planner page! I love this one, too! I love his cute, little face, and his bow tie, and his hearts that he has on his hands and feet. I’m not sure whether to eat him or to give him a big hug! This “Merry and Bright” quote on this planner page is in a lovely, cursive, brush script, and it just makes me smile. This next planner page has my sweet, little deer on it. She’s super cute with her blue eyes and her pink bow! And this last planner page is in the classic red and white for Christmas time, and it just says “DEC” on it, for December. It would be the perfect front dashboard for your December planner, or it would also be perfect for the front page for your December Daily/December Documented mini-album. And, finally, we have our transparency for this collection. We decided to do a cool, double-sided, metallic-foiled transparency for “December Dreams.” On the front you have a elegant, golden foil on our key to the Four Realms, and on the back, a traditional, Christmas red. Yay!! Ok! I hope you have enjoyed our full reveal of “December Dreams.” I have so enjoyed sharing with all of you the beautiful, one of a kind, and oh so magical pieces in this collection. You can purchase your kit today - just click here! Don’t miss out, because this collection is super duper beautiful, and definitely perfect for all your magical needs this holiday season. I think you will find that “December Dreams” will help make all your holiday crafty dreams come true! Hugs everyone and Happy Holidays!!! "Magical and Mischievous" Collection Full Reveal!!! Hello everyone! It’s Andrea here, and today I am super duper excited to share with you the full reveal of our new and amazing Halloween collection, “Magical and Mischievous.” I don’t know about you, but my very favorite holiday is Halloween. It is absolutely just the best time of the year, in my opinion, because it’s all about magic and imagination and a childlike sense of wonder. Halloween, to me, feels just like the one time of year where absolutely anything is possible, and magic seems to be just floating around in the air, everywhere you look. And we all get to be big kids again. We allow ourselves that silliness and that playful exuberance and mischievousness of youth, which I think escapes many of us in our normal, everyday lives. It is with these things in mind, and this special sensibility that emerges every year around this time, that I was inspired to create this new collection in celebration of my favorite holiday with all of you. As with all of our collections, I was inspired to create “Magical and Mischievous” by some of my favorite fairytales. This time, there are a few different ones that I think best fit the feeling of magic and childlike wonder that I want to convey for this Halloween. I was inspired by Tim Burton fairytales like "Nightmare Before Christmas" but also other classic stories he has told and his specific love of all things 50's and 60's retro. You can definitely see all the fun retro in the collection for sure! But first and foremost, I was inspired by J.K. Rowling's more modern, yet still classic fairytale of "Harry Potter" and the magical world of Witchcraft and Wizardry that she created! I wanted to create a mid-century modern magic look where the main concept is Halloween in the Wizarding World. Specifically, I wanted to create the kinds of things you might see on cards and wrapping paper and decorations in the Wizarding World during that retro era at Halloween-time! I kind of merged these ideas in my head and came up with the "Magical and Mischievous" collection which you see here today! I love the cool retro prints and how boldly they work together to bring such a vibrant and eclectic and whimsical look! And I super love the adorable witches and cats (who are also either transfigured witches or someone's purrrrrfect patronus)! I love the jack-o-lanterns that wink and smile at you (as if they're under some magic spell)! I love the fun little owls (who are clearly there for a party and not just to deliver mail). And I love all the yummy candy (which was probably purchased at Honeydukes)! And I love the fun colors in this collection -- the classic orange and black paired with some fun pinks and aquas and greens and purples! Alright, now that we have done a quick and basic overview of "Magical and Mischievous," let's get into some more detail. First, let's look at the patterned paper in the collection. The patterned papers in “Magical and Mischievous” are some of my favorite that we’ve ever done in any of our collections for The Fairytale Club, and, as I go over each patterned paper with you, you’ll probably be able to see why. So, for this first pattern, entitled “Magical and Mischievous” (just like the collection), we have a beautiful, retro-looking witch flying on her broomstick past lovely, shining stars and a whimsical, smiling, blue moon, her adorable, black cat in tow. This pattern has to be my favorite of all of them in the collection! It is just too cute for words, with that super adorable witch flying on All Hallow’s Eve. I love the little witch’s pink hair, and her lovely, little, frilly dress, and the fact that she seems to be having so much fun with her cute, little kitty. On the back of this patterned paper we have a beautiful, starry night on a light aqua background. All together, this page gives me lots of magical, witchcraft and wizardry vibes, while also hearkening back a bit to Bewitched and other vintage/retro-looking witches from the 50s and 60s. 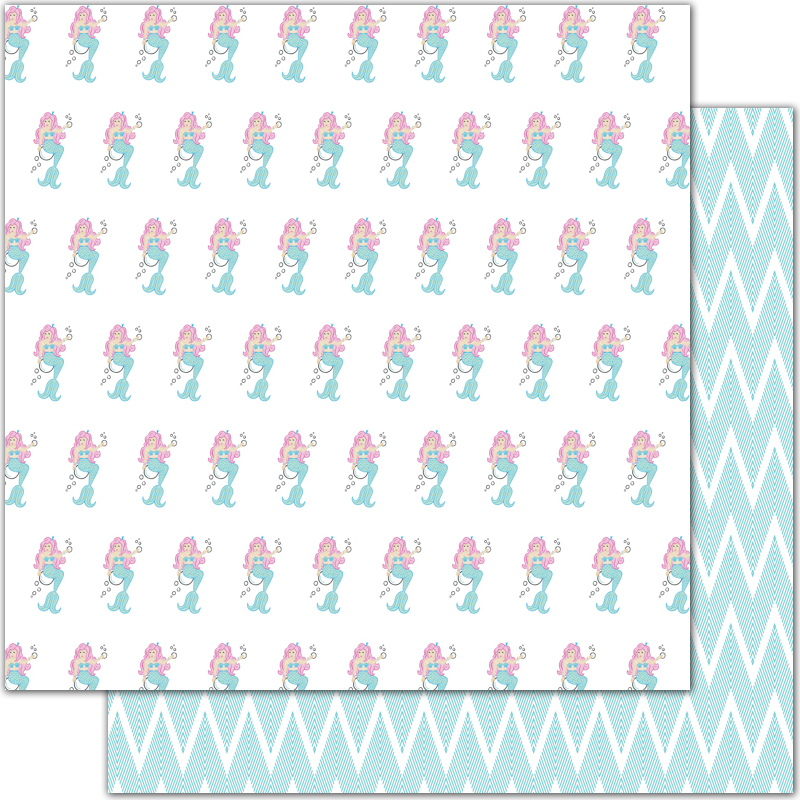 Our next patterned paper is called “I Want Candy,” and it’s also super retro/vintage-looking. It’s got an adorable, little, pumpkin pail with a grinning, jack-o-lantern face on it and lots and lots of yummy candy inside of it. I put my cute, little, pumpkin, candy pail atop a light mint background and surrounded him with some more candy, like big ole’ delicious lollipops. I don’t know about you, but when I think of Halloween, I think of trick-or-treating, and candy, and so this pattern is definitely an homage to both of those time-honored Halloween traditions. On the back of the paper, we have a sweet, pink and white chevron pattern, which is super cute and versatile, and I just love the addition of pink to the more traditional Halloween color palette of orange and black. Don’t you? This next paper is also definitely one of my all-time favorites. It’s called “I Heart October,” and it is so perfect to document your October/Halloween time. I think it would be adorable to use to count down the days to Halloween, as a part of a decorative holiday, countdown calendar for this spooky time of year. I also think that it’s perfect for any kind of October daily or October mini album that you might be creating, or even an October planner. It’s just way too cute for words, and, I think, super useful for any Halloween, paper-crafty projects. On the back of this cool calendar cutapart page, there is a very sweet, lavender pattern, with little, orange, jack-o-lantern hearts all across it. It’s a really sweet pattern, and I think it shows off my love of all things Halloween. The next pattern is “My Patronus is a Cat.” This is a really pretty pink pattern with lots of beautiful, black cats walking to and fro on it. When I created this pattern, I was thinking of the fact that every witch and wizard in the magical, Potter universe has a patronus that is particular to them and is always in the form of some kind of animal. And I just thought that our traditional, little, retro moon witch in our collection probably has a traditional and classic black cat for her patronus. On the back of this paper we have a super cool black geometric on white pattern. It reminds me of a pattern that you might see in the Potter-verse, particularly back in the 1920s, Fantastic Beasts era. Next let’s look at “Lovely Luna.” “Lovely Luna” is a lovely, lavender, circle pattern, which looks so much to me like something you’d see in the wizarding world in a “poppy” advertisement for Weasley’s Wizard Wheezes or some wrapping you might get on a candy from Honeydukes. It’s so fun and silly, and it just kind of reminds me of Luna’s playful personality and her exuberant sense of style. On the other side of this paper, we have a much simpler, but super duper versatile, orange on white geometric pattern that I think you’re going to love because you can use it for so many different things. This next pattern, titled “Spooky Spells,” is a beautiful and big and bold spider web pattern on the front and a much tinier and daintier lovely floral pattern on the back. I absolutely love these two patterns. The spider web in the simple, black and white combo screams traditional and classic Halloween, and the contrast of the pretty, orange and white floral pattern on the back is so interesting, and works so well with the collection, because it once again says vintage and brings a vintage/retro vibe to the collection, while also being more modern and out of the box, because you don’t necessarily think of florals for Halloween time. Now let’s look at the cutapart sheets. Our first cutapart is called “Magic is Real.” In this cutapart, we have several different sizes of cute, cutapart goodies. We have several 3x4 cards, several 2x2 cards, some awesome tags and labels, plus more! There’s so much to love about this cutapart sheet, but some of my favorite pieces are the sweet, little, waving skeleton card that says “Hi!” and the cool 3x4 “Book of Spells” card. On the back of this cutapart sheet, we have a super versatile black and white stripe, with a fun, modern, aqua triangle across the bottom corner. The next cutapart is called, “I Heart Halloween,” and it has mainly 3x4 cards on it. I love this cutapart sheet also, and some of my favorite pieces on this cutapart are the super cute “I Heart Halloween” 3x4 heart card, the “wicked but sweet” 3x4 card, the trio of winking, vintage pumpkins in various pastel colors, and, of course, my little haunted mansion. On the back of this cutapart sheet is a super retro-fabulous, black and orange pattern, which I love, and which is giving me such great 50s/60s vibes. Alright, now that we have looked at all of the beautiful, patterned papers in this collection, let’s now talk about the awesome embellishments that come in "Magical and Mischievous." First, let's start with our ephemera pack. We always do an ephemera pack for our collections/kits because I absolutely love ephemera, and obviously so do all of you because our ephemera packs are super popular and our best sellers...yay! And I think our ephemera packs are so loved because they just always have so many super cute and useful pieces inside them. We fill our packs with as many die cut pieces as possible. We really have fun creating these ephemera packs for you and creating lots of adorable little pieces that you can use to embellish your paper crafting projects, and so of course this time was no different. I am in love with the ephemera pack for "Magical and Mischievous!" It has so many magical and whimsical pieces in it! I can't name all of my favorites because we would be here all day, but let me go ahead and highlight a few: I love the little moon witch of course, and the three sort of cameo pieces (which include a close up of our little moon witch, a little black cat witch, and another cute little vintage witch with some fun green hair), all the cool little pumpkins and jack-o-lanterns in the pack (of which there are several different kinds and colors), the cute little candy treats, and especially the super cool poison apples, and my sweet little bats! Now I want to talk you about a really fun new embellishment that we’ve decided to do for our Magical and Mischievous collection. In the past we have done a few different “word” ephemera packs, and they are always very popular with our customers. However, this time we decided to do a new twist on one of our word packs, and add some really fun metallic foiling. In this collection/kit, you will receive a word ephemera pack filled to the brim with awesome Halloween words and some shapes, too, that will be perfect for your spooky papercrafting projects. All the words and shapes in the pack are silver and shiny and beautiful, and I’m so excited to see what you all do with these fun new silver ephemera pieces. I love our flair buttons that we’ve done for various kits in the past, and for this collection I decided that we definitely needed some cute, Halloween flair buttons that would work great to add some dimension to your papercrafting projects. All the flair buttons are adorable, but my favorites are probably the simple, black and white “Boo” flair button and the classic “scaredy cat” flair button. We have another new, cool embellishment that we’re debuting in this new “Magical and Mischievous” kit, and it is our decorative paperclips. These paperclips are fuzzy and adorable, and they come in a few different Halloween colors that match perfectly with the colors in our collection. They are great to use as a statement piece on your project or layout, and absolutely perfect for planners, mini albums, and October daily’s to highlight or mark your spot on specific pages. Alright, now let’s look at our planner pages that come in our “Magical and Mischievous” collection. If you order our planner version, or our Happily Ever After version of our kit, you will be receiving these planner pages, and I am telling you now that you need to get these planner pages, because they are just too cute for words, and absolutely perfect for any kind of Halloween mini album or October daily, or any other such kind of documenting album that you have planned for Halloween time. You get twelve of them, and they are all double-sided and just super duper adorable. Let’s look at the planner pages now individually. First, we have our Best Day Ever planner page. It’s black and white and evokes classic Halloween with its gorgeous spider web detailing. Our next planner page says “Happy Halloween,” and it’s way cute with the stripes in the background, and the fun Halloween font in the foreground. On the back we have a cool ledger paper that is perfect for any journaling that might want to do. Here we have our haunted mansion planner page. This is definitely one of my absolute favorites. Our haunted mansion image is just way cute. It’s a spooky, little, retro-looking, haunted house on top of a hill, surrounded by tombstones, some friendly ghosts, some spooky bats, a crescent moon, and a smiling jack-o-lantern. And the coolest thing of all is that our house itself seems to have a face and a personality all its own! It is truly a “haunted and adorable” house! This planner page, which we lovingly call “Humphrey the wicked party owl,” is also one of my favorites in the collection! I super love the way he looks with his little party hat on. And I also love his message for us, which is this: Something Wicked this way Comes! (i.e. it’s time for Halloween, everybody) I also love this planner page because it very much reminds me of the Wizarding World - the owls that they use to carry their messages - and I used the combination of these two patterns to really give it the look and feel of some kind of advertisement or something that could actually come from that magical world. Our next planner page is an awesome quote. It says, “Magic is real, it lives inside all of us, and its light shines brightest in times of wonder, love, and creativity” I love this quote! It reflects the magical experience that is Halloween time. On the back is a special surprise, as I have placed for you a super cute October calendar that you can use to count down the days to Halloween, or mark out your plans in your planner, or document your October in any October Daily or October document mini album that you might make. Our next planner page is also one of my absolute favorites. I love love love this one! The quote is great: “Magic is something you make!” But the best thing about it is that it’s written in such a way that it looks like a witch or wizard is, with their wand, creating the script out of thin air. I love the way this page looks and also the message, because I really do believe that magic is something we create. Especially as a crafter, I think by using our imaginations and creating beautiful things, we are literally making magic, just like any good witch or wizard would. Here is our “I want candy” planner page. I also love this one. It’s got an adorable smiling jack-o-lantern candy pail on it, it’s super retro and super cute, and just makes me want to start eating all of the Halloween candy right now! Here is our “double double toil and trouble” planner page. I love the bubbling cauldron and this classic Halloween quote from Shakespeare’s Macbeth. I love that it’s also a song that's sung in one of the Potter movies (Prisoner of Azkaban) and the spooky feeling that it gives you just…saying it out loud. Here is our moon witch planner page. She is just so special and magical and beautiful. This is definitely one of my favorite planner pages. I love our little witch’s pink hair, how sassy and cute and retro she is, the adorable little kitty sitting next to her, the happy crescent moon, and just everything about this page. It is practically perfect in every “witch” way. Here we have another beautiful witch in our collection. She is super cute, also, and, as you can see by the banner at the bottom of the page, she is both “magical and mischievous.” I don’t know what she has behind her back, but I have a feeling I shouldn’t ask, as I don’t want to get on the wicked side of this particular witch. By the way, this planner page, with its giant cameo and it’s obvious purple and white stripes, is totally giving me fabulous Tim Burton vibes! “Hello October” is our next planner page. It has an adorable, winking pumpkin on the front, and it kind of looks like the cover of a vintage magazine. Last but not least is our adorable cat witch planner page. Again I’ve combined two different patterns in the background to create a look reminiscent of something in the Wizarding World. And our cat itself is super cute. She’s retro, and she is a super happy and adorable little black cat, although the fact that she’s also a witch makes me wonder if she has also perhaps performed a transfiguarion spell or is under the influence of some polyjuice potion. And here we have our transparency for this collection. It is silver, metallic foiled, and super beautiful. You are going to love how it shimmers and shines and how perfect it is for so many of your spooky, Halloween papercrafting projects. Ok! I hope you have enjoyed our full reveal of “Magical and Mischievous.” I have so enjoyed sharing with all of you the beautiful, one of a kind, and oh so magical pieces in this collection. You can purchase your kit today - just click here! - and kits will start shipping out next week. Don’t miss out, because this collection is super duper adorable, and definitely perfect for all your magical needs this Halloween season. "Tiki, I Love You!" Full Reveal!!! Hello there, everyone! 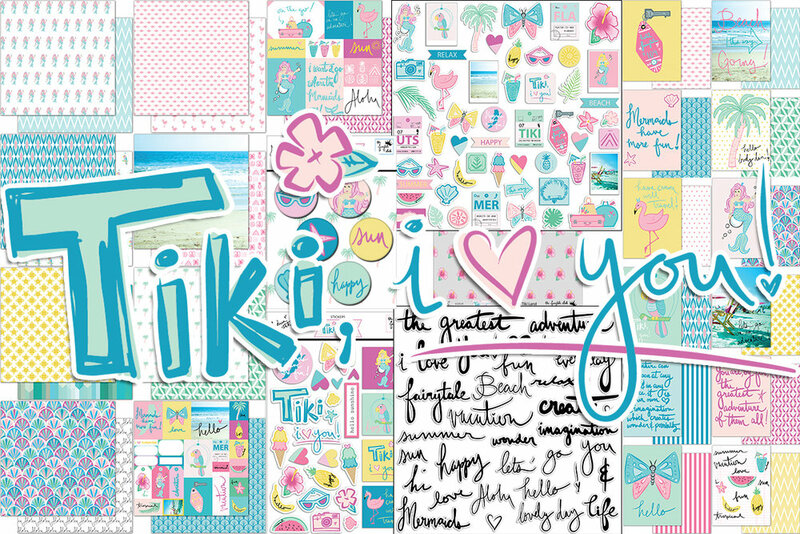 It's Andrea here, today, and I am so excited to share with you today our newest collection, "Tiki, I Love You!" I absolutely love this new fun and vibrant summer collection/kit that we have created for you. It is the perfect kit to use to plan, document, or craft for all your summertime adventures! Read on to learn all about this awesome collection, or click here to purchase your kit right now! "Tiki, I Love You" is so cool for so many reasons. The fabulous vintage-retro look of this kit is so cute! And the kit is filled with awesome summertime symbols like whimsical mermaids, pretty pink flamingos, swaying palm trees, tropical fruits and flowers, and scenic beach scenes! All of it reminds me of the perfect summer day and makes me want to go on a fun summer vacation! And I should probably mention that while I was creating this collection I was very much inspired by Tiki and Tropical imagery which can be found at different Disney locations, such as Disney's Adventureland and The Enchanted Tiki Room and also the Submarine Voyage ride (when it used to have mermaids), plus Castaway Cay, Trader Sams, and the Polynesian resort in Disneyworld! They are all so retro Tiki fabulous and they all scream Tropical adventure! The color palette for this collection is also evocative of summertime with its pretty sea blues and greens, the vibrant, sunshiny yellows, and all the really gorgeous, bold and bright pinks! And I am loving all the super cool embellishments that are in this collection! For example, there is a beautiful ephemera pack, some fabulous flair buttons, a great sticker sheet, and some very useful and versatile word die-cuts. Alright, now that we have done a quick and basic overview of "Tiki, I love you", let's get into some more detail. First, let's look at the patterned paper in the collection. The patterned papers in the collection are so beautiful! They all have that fun Tiki look and feel which was so very popular in the 50's and 60's and which you can still find today in places like Beachside restaurants, Tiki bars, fun Lua parties, and of course, Adventureland and the Enchanted Tiki Room in Disneyland! One of my favorite patterned papers in the collection is "Mermaids Have More Fun," with all the beautiful, pink-haired mermaids on it! See how the mermaid in the pattern sits on a large bubble and other little bubbles float around her? For this reason, I have decided to refer to our mermaid friend as "Bubbles"...isn't she so pretty and sweet and magical?! She is inspired by the mermaids who used to inhabit the sweet Mermaid Lagoon in the middle of the Submarine Voyage ride at Disneyland. They only had the mermaids there for a couple of years in the 60's...but they were so happy and fun, and I do so wish they would bring them back again! As for the back of the paper...that is so great and versatile too with the lovely and modern blue chevron. It reminds me of the ocean, but can really be used for anything! This patterned paper, entitled "The Pink of Perfection," has lots of pretty pink on both sides! On one side you find a cool and versatile pink geometric which is simple but beautiful, and on the other you find lots of glamorous pink flamingos! Each girly flamingo in the pattern has a cute little crown on her head...because she is "the pink of perfection" and should therefore be treated accordingly, as the princess she is! Lol! The geometric pattern on the front of the "Tiki, I Love You" patterned paper is so retro-chic and definitely fits in with the Tiki theme of the collection! But this page is really named "Tiki, I Love You" because of the cute Parrots on the back of the page...why, you ask? Well, because I named that cute little parrot that you can find throughout the collection, Tiki! And Tiki is of course inspired by the amazing parrots that you can find in the Enchanted Tiki Room at Disneyland, a fave attraction of mine and a classic which has been in the park since the 60's! I absolutely love the paper called "By The Beautiful Sea!" It has an amazing ocean view on the front that just makes me long to go to the beach immediately! And on the back of the paper is a really awesome pink Tiki pattern that has little Hawaiian symbols on it...like a pineapple and a volcano! "In Summer" is a really fantastic patterned paper from the collection! On the front is a bright and sunshiny yellow pattern that feels rather festive. And on the back is a super dreamy blue and green geometric which has this really cool waterfall kind of effect which I love! This lovely palm tree patterned paper is way cute! I find the pattern super relaxing. It is called "Castaway Key" and you probably already guessed why! The paper is named for that famous Disney destination in the Caribbean! I would love to go there one day! On the other side of the paper is a great green-toned geometric pattern which has a great vintage Tiki look to it...but is such a cute and simple geometric, that it can be used for really anything. Another favorite paper of mine is the really beautiful multi-colored seashell pattern called "Aloha!" It is filled with gorgeous and intricate seashells that come in various shades of pinks and blues and greens. They look like the scales on a mermaid's tail, actually, and they are so very lovely! I imagine them shimmering in the sunlight, and that is why they create that multi-colored, prismatic effect. The paper is called Aloha because of the Aloha script that is written across the backside of the paper. "Tropical Adventure" is one of two cut-apart sheets that are in the collection, and it may be my favorite of the two! On the front is a ton of great little pieces that you can cut out and use, like adorable little tags with things like a beautiful mermaid and the word "adventure" on them, 2x2 cards with tropical images on each one like a cocktail, a banana, and a palm tree, and super useful little labels which you can use to write on. On the back of the paper is a beautiful monotone blue pattern which has a kind of fish-scale look to it. The other cut-apart sheet, which is called "On the Go," has some really awesome 3x4 and 4x6 cards on it! I especially love the mermaid ones -- like the one which says "I want to go where the mermaids are." I also enjoy the card with the suitcases that says "on the go" and the one that says "let's go on an adventure!" On the back of the paper is a pretty and way cool multi-pink geometric pattern which is very retro and Tiki looking...it's fabulous! Alright, now that we have looked at all the beautiful patterned papers that are in the collection, let's take a look at the ephemera pack. I absolutely always super duper love the ephemera packs that are in our kits! We always make sure to fill them up as much as we possibly can with lots and lots of special goodies! In the case of this ephemera pack, we have filled the pack to the brim with the cutest little die-cuts which have amazing images on them like mermaids, sunglasses, ice-creams, and butterflies! One of my favorite things in the ephemera pack are the incredibly cute little polaroids that have either beautiful scenic beach photos in them or very adorable drawings of parrots or mermaids on them! I'm also super excited for the little vintage travel/luggage tags in the pack that have cute things written on them like "MER" for mermaid, etc! Let's take a look at the "words" die-cut pack in the kit. I love doing packs like this because they are super useful! There is just so much that you can do with these words. I created them in black and white so that they would be uber versatile. And the words included in the pack say things like "beach," "summer," "vacation," and "mermaid," which all go with the Tiki and tropical theme of the collection...but there are also words like "happy," "create," "imagination," "love," and "everyday," which are so versatile and great to use for lots of different themes! Okay, now I want to share with you the flair buttons that come in "Tiki, I Love You!" Our flair buttons are always so awesome and fun to use. In particular, I love using them to create cute decorative paperclips! On the flair buttons we have some words like "happy" and "sun," but also simple images like sunglasses, starfish, and a seashell, and also a really gorgeous close-up of our collection's pink haired mermaid, "Bubbles!" And now, let's check out the sticker sheet that is in the kit. This is a really great sticker sheet! I love the sticker that says "mermaids have more fun" with the little mermaid silhouette on it and the little label one that says "hello sunshine." The little half and half hearts are so cool and the little ice creams are adorable! 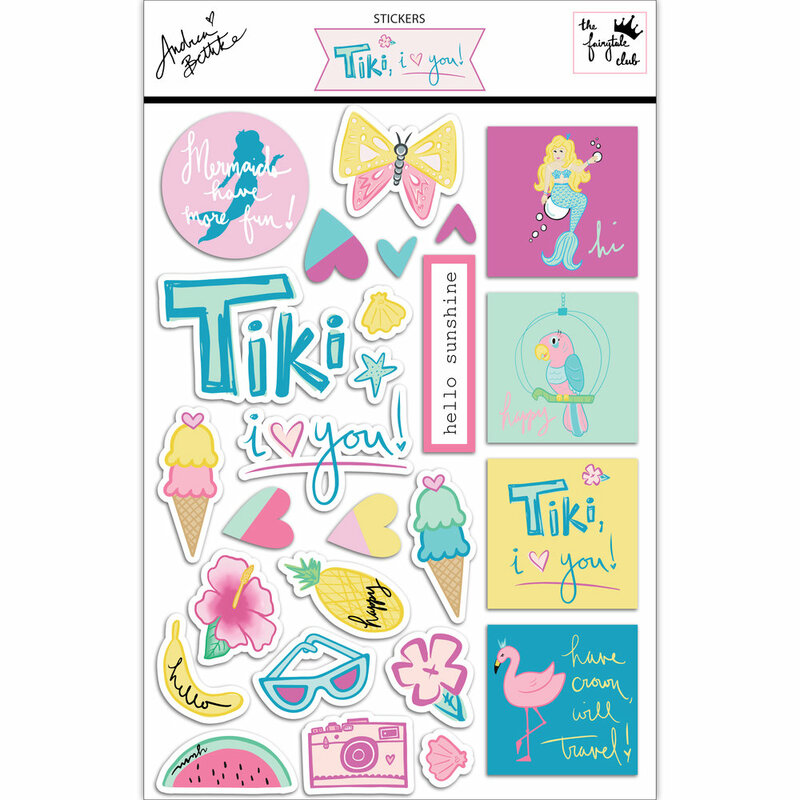 The square stickers are faves too, especially the blonde mermaid that says "hi" and the little, yellow one that says "Tiki, I love you." 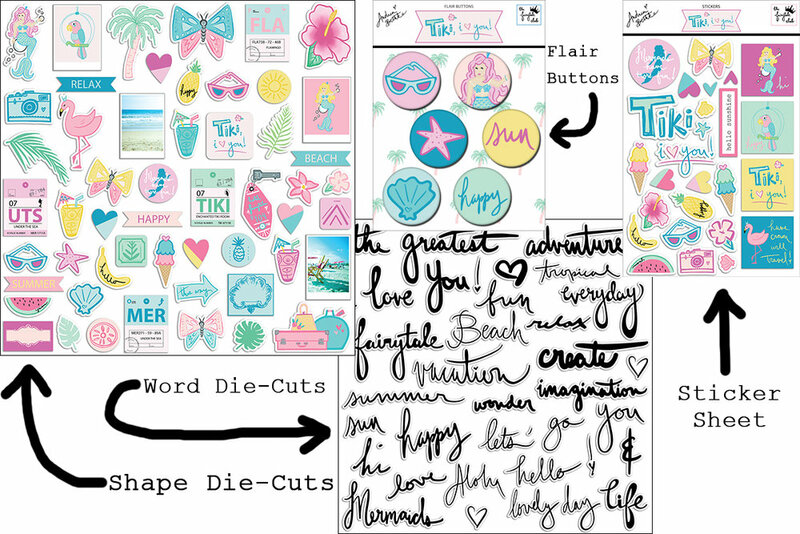 Okay, now that we have gone over all of the embellishments in the collection, let's go over the planner pages that are in "Tiki, I Love You!" All of them are super cute and perfect for your planner, your mini-album, or even to use to hang on your wall! One of the really great planner pages in the collection is this cool key with vintage hotel key-chain! I love this image (which you can find throughout the collection, like in the ephemera pack and on the cut-apart sheet)! I enjoy vintage hotel key-chains like this which are totally old school! This one is so special as it unlocks room "109" at the "hotel fairytale!" The "Beach Going...this way" planner page has an incredible image of the beach behind it! The water is so bright blue and the sand looks so soft... I just want to go to that beach right now and take a dip in that water! "Mermaids have more fun" is one of my favorite planner pages! I love that quote, and it looks so pretty on pink with the little seashell and the starfish in the corners. The palm tree planner page that says "hello lovely day" on it is way cute with the sweet mint palm leaves and the pretty pink trunk! The polka dots in the background make it even cuter! My "have crown, will travel" flamingo planner page is one of my faves! She is so royal and special, my pink flamingo! The next planner page is possibly my absolute favorite!!! It has my super adorable and beautiful pink-haired mermaid "Bubbles" on it! She is floating, sitting on a big bubble, with little bubbles floating around her...a crown on her head, and pearls on her shoulders and wrists. She is so glam! And she reminds me of the sweet and sassy mermaid girls from the early 60's who sat and lounged and swam in their own special Mermaid Lagoon as part of the Submarine Voyage ride at Disneyland. Another one of my favorite planner pages is the "Tiki, I love you" one with the parrot on it named "Tiki!" She is a super cute parrot in pink and aqua, and she is clearly having fun hanging out on her little swing. This planner page is very much inspired by "The Enchanted Tiki Room," and every time I look at it I just want to go back there again and see the birds on their perches lower down from the ceiling and start singing! This planner page, which says "let's go on an adventure," has a cool beach scene pictured on it. I love this image, which has some folding chairs and umbrellas on it as well as beach-goers in the background...the sky is so blue and happy and you just want to go on that adventure on the beach! "Adventure can happen at any time and in any place, it is your own heart and imagination which creates wonder and possibility" -- this is another fave planner page of mine. I love the blue on blue look of this, but the quote is definitely the best part! The quote planner page which says "you are, by far, the greatest adventure of them all" is fantastic! And I made it because I wanted to remind myself and others that the greatest adventures in our lives are people, the people we love, and not places that we go to...no matter how pretty they may be. The butterfly planner page that says "hello" is so beautiful! It is another favorite! I love the wings on the butterfly...the design on the wings and the blue and pink colors too! And the last planner page is another big favorite of mine! It has a ledger in the background and has words like "sun" and "fun," "love," "summer," and "relax" on it...as well as great tropical images like a cute pineapple that says "happy on it" and a lovely watermelon that says "yum"! And, finally, there is the vellum page that comes in the collection called, "Welcome to Tiki-land." I love this vellum sheet! It has tropical flowers all over it and is so beautiful! "The Wonderful World of Disney" Special Event Kit Full Reveal!!! Hello there everyone! It’s Andrea here, and today I want to share with you the full reveal of our beautiful new specialty kit “The Wonderful World of Disney” which we made special for, and revealed at, our recent papercrafting event at Disneyland! It is such an amazing kit and just filled with the cutest vintage-retro Disney designs! I don’t know about you, but I love Disney! And the only thing better than Disney is vintage Disney!!! There is so much nostalgic awesome-ness in this collection and I can’t wait to show it all to you! First, let’s talk about what the kit was inspired by and what it is all about. Whenever we have a special event, we do a special kit that is specifically made and themed for the event and the project that goes with that event/class. We have had a couple events before at Disneyland and they are always filled with Disney magic and they focus on a particular Disney theme (like “Mad Tea Party” for our Alice in Wonderland themed event and “Spooky” for our Haunted Mansion themed event)...and this time was no different! For our most recent event at Disneyland, the theme was “The Wonderful World of Disney,” which was about vintage Disney and the opening of Disneyland in 1955. And it is specifically about the show “The Wonderful World of Disney” which Walt Disney created in order to hype the park’s opening. In the show he revealed sneak peeks of the park and specifically its cool rides and attractions. For this reason, the collection is filled with lots of vintage Disney and Disneyland favorites from the 50’s and 60’s, like rides such as Dumbo and Teacups and It’s A Small World, and vintage Disney symbols like the castle, Mickey and Minnie, and the Mouseketeers! This new collection, “The Wonderful World of Disney,” is so magical, and I love it so much! I know you will love it, too! Let’s take a look at all the cute goodies inside the kit, shall we? First, let's look at all the beautiful patterned papers in the kit. As you can see, the color scheme for this collection is composed of lots of pretty pastels combined with classic black and white. So there are lots of cute light pinks and lavenders and blues and yellows. This color scheme is perfect for the vintage vibe of the collection as it helps evoke that sweet, whimsical, and mid-century modern feeling of Disneyland back when it first opened in 1955. This vintage-retro vibe especially comes through in the types of patterns in the collection, not just the colors. I am so happy with the way the patterns came out in this collection. They are super duper cute! And oh so vintage Disney! I have lots of favorites in this collection, and one of my favorites is the beautiful black and white patterned paper called “Mouseketeer”! It is so adorable and it has lots of vintage icons in it, including some cute little atomic images and the vintage Disneyland “D” and also the old Mouseketeer hat. On the back of this paper, is a beautiful multi-colored hexagon pattern that sort of gives an ombré effect. Another favorite pattern of mine in the collection is the “Welcome to Disneyland” pattern that has the word Disneyland all across it. It is inspired by the vintage Disneyland hotel sign and is way cute! I also really love the pattern called “The Wonderful World of Disney” (just like the name of thee collection), it has a kind of tile pattern which can either look like cubes or stars depending on how you look at it and which, with all of its various colors, feels very pretty and magical! On the back of this paper is another fave pattern of mine, the cute little lavender Minnie ears! They are so beautiful! And the pattern reminds me of my own collection of Minnie ears which I love to wear! “I Heart the Castle” is another favorite and super beautiful pattern from the collection, and it of course has the lovely Sleeping Beauty castle from Disneyland on it! The balloon pattern on the back of the “My Happy Place” paper is also so special and cute! It just makes me smile! And I love the blues on both sides of the “It’s a Small World” paper! The geometric pattern on the front is awesomely retro! And the cute little Small World happy faces on the back are just so sweet! Finally, let's take a look at the cut-apart sheets in the collection. There is the first one, called “Disney Girl,” and the second one, called “Hi Mickey Mouse." They are filled with fabulous vintage images like my cute, pink-haired Mouseketeer girl, Dumbo from the Flying Elephant ride, the Sleeping Beauty castle, the spinning Teacups, Small World, and Mickey and Minnie of course! And they each have some really pretty vintage-retro patterns on the back of them as well! Alright, now that we have looked at the pretty patterned papers in the collection, lets take a look at the embellishments in “The Wonderful World of Disney”. This collection has a few really cute embellishments in it. One of which is the ephemera pack. The ephemera pack in this collection is super duper cute! I always love the ephemera packs in our kits! This one may be my absolute favorite though! It has some really amazing bits and pieces in it, like my cute little teacups, adorable little Mickey Mouse silhouettes, and cool script words like “magic” and “believe.” And some of my favorite die-cut pieces in it include the heart piece where Mickey and Minnie are kissing, the pretty, multi-colored “Love” word piece, the Small World building, Mickey and Minnie Mouse faces, and the cool vintage Tinkerbell piece with the castle in the background. And that’s just to name a few! Now let's take a look at the pretty flair buttons that come in the collection. These flair are my most favorite ever I think! There is a really pretty castle, a cute Mouseketeer hat, Mickey and Minnie’s faces, the Small World face, and the vintage Disney D! And before we talk about another super special embellishment (which I am saving to talk about at the end), let’s go ahead and look at all the super amazing planner divider pages that come in “The Wonderful World of Disney”! These dividers are so beautiful and vintage fabulous! Just like the patterned papers in this collection, I have lots of favorite planner dividers too! One of my favorites is the cool divider that says “The Wonderful World of Disney” on it. It is so very pretty with the ombré/rainbow effect on the words and also the cute little Tinkerbell floating about on the page with her magical wand! Another favorite divider of mine is the oh so pretty Small World one with my version of the ride's building on it. I designed it to be quite colorful, with all the lovely pastels and I think it looks super cute with the fun banners and numbers and the sweet and happy clock face! I super love the romantic Mickey + Minnie divider with the big heart, the signatures and their cute little mouse faces on it! Way cute! The Dumbo divider is also really sweet and cute and definitely another fave! It is a depiction of the Dumbo The Flying Elephant ride and is very vintage and whimsical with the pretty pinks! Of course the castle divider is way beautiful and one of my absolute favorites too! I really love the phrase dividers that come in this collection too! Especially the one that says “Make Magic Each Day” on it! And I also really, really love the divider with my cute vintage pink-haired Mouseketeer girl! She is a big Disney fan just like me! The calendar dividers are so cool and useful too! 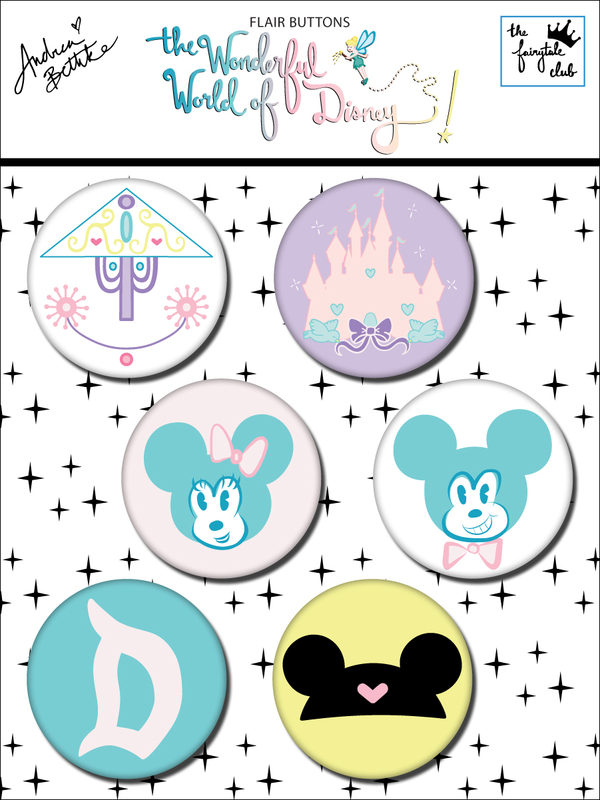 Finally, now that we have gone through all of the cute dividers in “The Wonderful World of Disney,” let’s talk about what I think to be the best and coolest part of the collection and a new and super special surprise that I made particularly for this special event collection and which I am so very excited about!...our new enamel pin! Yes, that is right, we made a pin! And it is so very super duper adorable and girly and vintage-kitschy-cute! It is in pretty pinks and lavenders and blues and looks super “Kuwaii” if you ask me! It is a fun pink cameo of the Sleeping Beauty Disneyland castle and it has the sweet little Disney birds with a big pretty bow on it! I just absolutely love it! It is perfect to use to wear and also perfect to put on your planner/scrapbook album as another embellishment!!! It is just perfect! I am super excited about this pin and I hope that it is just the first of many pins from The Fairytale Club to come! Alright, now that’s it for this reveal of the new “The Wonderful World of Disney” collection. I hope you enjoyed it and are as excited about it and in love with it as I am! The collection is up for sale now! Talk to you later everyone! Hello there everyone! It's Andrea here and I am so excited today to be sharing with you the Full Reveal of our newest collection, "Hello Beautiful!" !!! Yaaaaaay!!!! I am super duper excited for this collection guys! It is just so special! So, with no further ado, let's dive right in and take a look at this gorgeous new collection/kit! First, I want to talk a little bit about "Hello Beautiful!" as a whole - what inspired me and what it's all about. So, the big inspiration here should be fairly obvious...I think you can probably guess that I was inspired a lot by my favorite fairytale princess, Snow White. I have loved the story of Snow White since I was little and to be honest, she has had a pretty big impact on my life and the person I strive to be. I love that Snow White is described as being beautiful on the inside as well as the out...that in fact, her outward appearance is merely a reflection of the good, kind, selfless, strong and courageous heart that lies within. This is what makes her truly beautiful..."the fairest of them all" even! And this is what I always want to focus on in my life, being a good person, having courage and helping others. I think I, and pretty much all of us, forget how very important those things are sometimes. Instead we focus on other things. And, like many other women, when I do focus on superficial things, like my outward appearance, I always seem to find fault and flaws. This is something I wanted to address with this collection as well...not just the importance of being beautiful on the inside, but also the importance of believing in oneself and feeling beautiful! And I wanted to talk about love with this collection, because love is what it all boils down too. What makes us be good and kind and courageous and selfless and strong...is always love. So love makes us beautiful. Loving others. But we also have to love ourselves, so that we can feel beautiful. Anyways, that is sort of the main theme or idea behind this collection, and why I wanted to call it "Hello Beautiful! ", so as to remind myself and all of you too, how important it is to be your best self, inside and out, and also to recognize that wonderful self with a big, loud, resounding "Hello Beautiful"! Okay, now that we have talked about the inspiration and the general theme...let's look at some of the specifics that make "Hello Beautiful! ", so...well...beautiful! For instance, when you look at the collection as a whole, you can see that there is a lot of imagery that is very reminiscent of an enchanted forest. I love the idea of an "enchanted forest"...it is something that shows up a lot in fairytales in general and the story of Snow White is no different in that regard. There is a fores, which seems to be magical in some way...and at first that magic seems scary, or even evil...but then Snow White realizes that it is actually quite beautiful and whimsical, filled with adorable creatures and potential friends. I think this is probably some kind of metaphor for the real world, which is often scary and can even seem very bad and sad sometimes, but which is actually quite beautiful and filled with wonder and love! I wanted that version of the "enchanted forest" to shine through in this collection. I wanted you to feel that beauty and wonder! I also filled the collection with things that I thought would work for planning and documenting our real world, everyday lives...I used pretty and soft floral patterns, mixed with simple but bold graphic patterns that I know convey that "beauty within and without" kind of feeling that I hope you will see and feel as you plan, document, craft and create for your daily life! Now, let's talk a bit about the color-scheme of "Hello Beautiful! "...I love it! And here is why...it has all these really beautiful shades of pink and also red, which of course I love because I am a super girly girl! But it also has these amazing greens which give that great "enchanted forest" kind of natural, great outdoors feeling which I am in love with right now. And then on top of all that, there is a pop of yellow (and anyone who knows me knows that yellow is not really my fave color to be honest, but it is so great to have a splash of here and there because it makes the other colors pop more...and I do love that!). And perhaps most importantly, it has these really amazing blues! I love the color blue just as much as I love pink...and I am particularly in love with the royal blues that you find in this collection, they just make everything look so beautiful and fresh and magical! So basically, I just love this color-scheme so much! It is amazing and just gives you a good feeling that makes you smile! Alright, now let's talk about the pattern papers in the collection. We will go through them one by one and I will talk a bit about why I think each one is so special. The first one I want to talk about is called "Hello Beautiful", just like the collection. It is perfectly named because it is so beautiful...gorgeous...lovely....stunning...pretty...really any adverb that you want to use for beautiful will do here in describing this patterned paper! I think it may be my new favorite paper ever! It is just so cool! The vines winding around and throughout the paper, with the bits of Snow White's story dripping from them...well it is just so visually engaging and alluring! You could fussy cut out individual pieces, or use it as a whole...and you could even frame it if you wanted to. And on the back is a great and super versatile simple white ledger which is perfect for journaling. Another one of my favorite patterned papers is called "Fairest". I love it! It has that gorgeous, bright, bold royal blue in the background and then this adorable floral on top! Super cute! And on the back, a simple and oh so useful, little white and black polka dot! Now lets look at "Kindness". It is a really beautiful blue on blue pattern paper which is just filled with butterflies! I love butterflies! And on the back is a great white and black diamond pattern that feels both modern and vintage! "Happy" is another fave pattern of mine and it is this awesome striped paper that has almost all the colors in this collection running across (or down) it...in a kind of ombre style. It sure does make my happy...so it is aptly named! And on the back is a fabulous, geometric, vintage pink pattern! I also really love the pattern called "Bashful", which is the one with the little deer and bunny on it! Super duper adorable and lovely! And on the back is a really sublime and relaxing blue on blue graphic pattern that is super versatile! 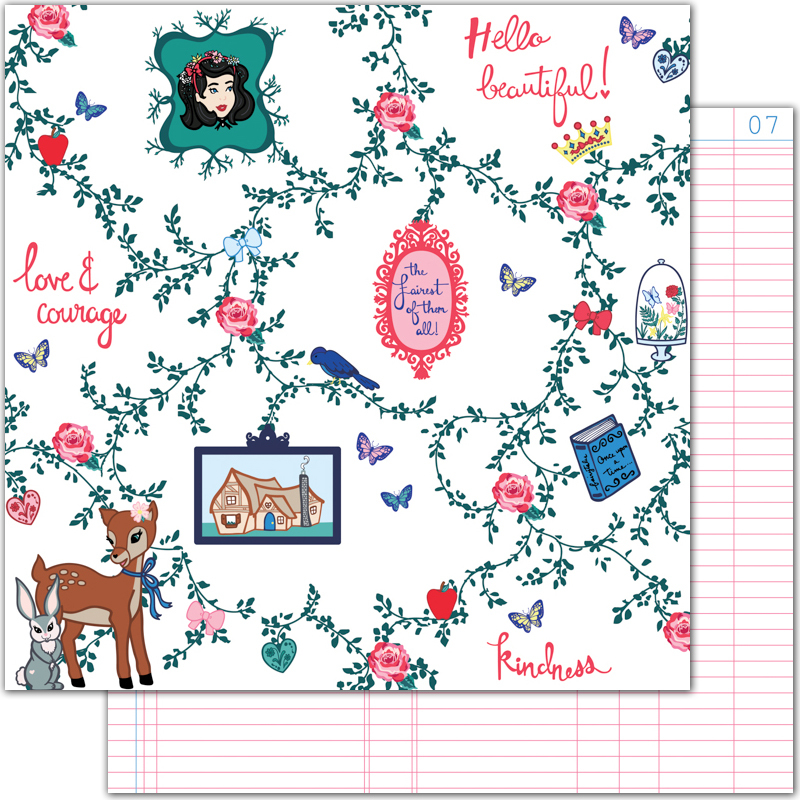 "The Enchanted Forest" is a pattern with lots of gorgeous roses on it...and lots of pink and red...yay! It is perfect for fussy cutting for sure and I love the ombre effect in the background. Then, on the back of this paper is an awesome medallion pattern that has leaves and flowers on it and frankly both sides work together beautifully to just scream "enchanted forest"! I really love the pattern "Fairytales" too because it is so simple but so elegant! It is a tiny pink floral pattern that almost looks embroidered on top of a pretty green background. And on the back is an amazing ledger...which you can also read, beginning to end and which talks about fairytales and what they are all about! "A Beautiful Day" is one of our signature cut-apart sheets. We always do at least two cut-apart sheets in our collections and I love all of them but I especially love this one! It has lots of references to beauty and love on it...and tons of cute and pretty graphics...but I also really enjoy the little joke about apples on it! And on the back is a rich green on green geometric pattern. And finally there is "Sleepy", which has tons of great 3x4 cards and 4x6 ones too...but my favorite may be the one that says "mornings are evil" on it...let's just say I am not a morning person. And on the back is a fantastic pink and red graphic pattern. Alright, now lets talk about the embellishments in this collection. First, let's take a look at the ephemera pack. We always do an ephemera pack and they are so loved and popular because of all the cool stuff that come inside each pack! This one is no different...it is filled with gorgeous images! It has cute little animals like my little fawn with the flower in her hair, and my sweet little bunny! It has birds and butterflies and plants and flowers and lots of references to nature and natural beauty. It has bows and hearts and labels and tags and even a cool letter! Plus, it of course has a crown, a fairytale book, and a framed pic of a very beautiful girl..."the fairest of them all" you might say! After we sold out of the words ephemera pack from our "Everyday Wishes" collection...I knew I had to do a words ephemera pack again! So this time, for "Hello Beautiful!" I added in a whole lot of color and some beautiful florals as well! Alright, not lets look at the Flair Buttons in the collection. I love flair buttons! I just think they are so useful and perfect to add dimension. I also am in love with making them into cute little decorative paperclips! And the ones in this collection are just so cute...especially the little deer one and the pretty pink rose! Now let's talk about stickers! The Sticker Sheet in "Hello Beautiful!" has tons of pretty stickers on it! I particularly enjoy all the birds, the labels, and that super cute little cottage! Alright, now that we have gone over all of the embellishments, lets talk Planner Dividers! I love all these planner dividers so much! And because I was so inspired with this collection's theme...I decided to add in a couple extra goodies with this planner set...(i.e. a couple super-double-sided planner pages). This planner divider is so pretty and just one of my favorite quotes from a certain, beautiful and kind princess! This planner divider is my favorite I think...just love this framed little lady with the flowers in her hair and the sweet, happy look on her face! This divider is so cool...with perhaps the best quote ever on it! Look at it and remind yourself that you are "the fairest of them all" just like it says! Love the big bold rose planner divider....pink roses always make me smile! This quote is one of my faves too! I know its true and really important to remember! I love this planner divider too! The little blue birds are so cute and clearly so in love! This is one of the special super-double-sided planner dividers...because it has a cool decorative front on both sides basically...as opposed to a simple pattern on the back. I love both sides of this one. The butterfly that reminds you to "be yourself" because yourself is beautiful like a butterfly. Oh...and I especially love the side that says "mornings are evil" with the sweet florals on it...it just looks like something I would want to embroider on a pillow! Once again...I am not a morning person. The planner divider that says "Hello Beautiful" has an amazing crown on it that is perfect for you because you are "the fairest of them all"! Love this special super-double-sided planner divider too...one side has an important quote about beauty on it, and the other says "you are my favorite"! And this little deer and bunny are of course, a huuuuge fave of mine as well! I love this planner divider! It is just too cute for words! Here is my lovely cloche planner divider...with the cool little mini garden or "terrarium" on the inside, and underneath it says "a beautiful day"...so elegant and enchanting! And finally, here is a super funny and awesome planner divider that starts our with the "some day when spring is here..." quote from Snow White...but ends by making it clear that no spring-cleaning will be going on in my house if I can help it! I hate house-work! That is one thing Snow and I definitely don't have in common! And finally, for this collection, we decided to try something new and ado a Vellum Sheet! We have done transparencies before but never vellum and I am so excited to try this out! It is a gorgeous gold-foiled on vellum floral pattern and I love it! Alright, that is all for our newest collection/kit "Hello Beautiful!" I can't say enough good things about this collection! I really put my heart in it, and I hope that that comes across and that it inspires you to feel beautiful and create beautiful things!!! It's available to purchase now! Yay! Hugs everyone!!! Hello there to all our Fairytale Club peeps! It's Andrea here, and I wanted to share with you all the full reveal of our newest kit, "Happy Day"! Yaaaay!!!! Wow, I have been wanting so bad to share this full reveal with all of you for so long, and I am so glad that day is finally here! I know that those of you who are subscribers did already get this kit and have seen it in full and I am so glad to hear from some of you already that you are loving playing with it! We did actually send it out around a couple weeks ago to subscribers, and we revealed it in person at Planner Con in San Francisco and sold it to some very lucky ladies while we were there last weekend. But with everything that has been going on recently, I just haven't had a chance to do this reveal post before now and officially put it up for purchase on our website...I am sorry for that...but the wait is over! Those of you who aren't subscribed, and weren't able to join us at Planner Con, can now see the super duper adorable-ness that is "Happy Day" and purchase it now, too! And I really think it will make you super happy! Let's now go through all of "Happy Day," and you can see why it is already a big hit with our subscribers and those who got it in San Francisco! Alright, so first of all...how pretty is "Happy Day"?! I just love it so much!!!! Now, I know I do tend to say that a lot, but I just mean it a lot! This kit is so very sweet and filled with such a happy feeling! It has got this really amazing vintage-retro vibe to it, too, which just makes me smile! The colors of the kit are so very happy as you can see! There are a few lovely shades of pink (are you surprised?...I think not...I think we all know by now how I feel about pink), and there is mint and dark teal, a couple different shades of lavender, and also a nice pop of red for some drama!...oooooh!...plus some classic black and white and a little bit of gray in there too. All together, I just love the color scheme for "Happy Day"! It has a fun fresh vibe, while still feeling very nostalgic! As you know, all of our kits/collections are inspired by fairytales and of course, "Happy Day" is no different! For this one, I was inspired by a few different things that are just making me happy right now and have been on my mind lately. I was particularly inspired by Minnie Mouse and specifically her house in Toon Town! I kind of think of the collection as a whole as just being filled with all the things you would find at her house...her decor, her love of pink and hearts and butterflies, her kitty cat, her big pink phone, etc. The little houses remind me of her house, but I was also a little inspired by the house in the movie "Up" as well, just in that I wanted a bit more of a Victorian look. 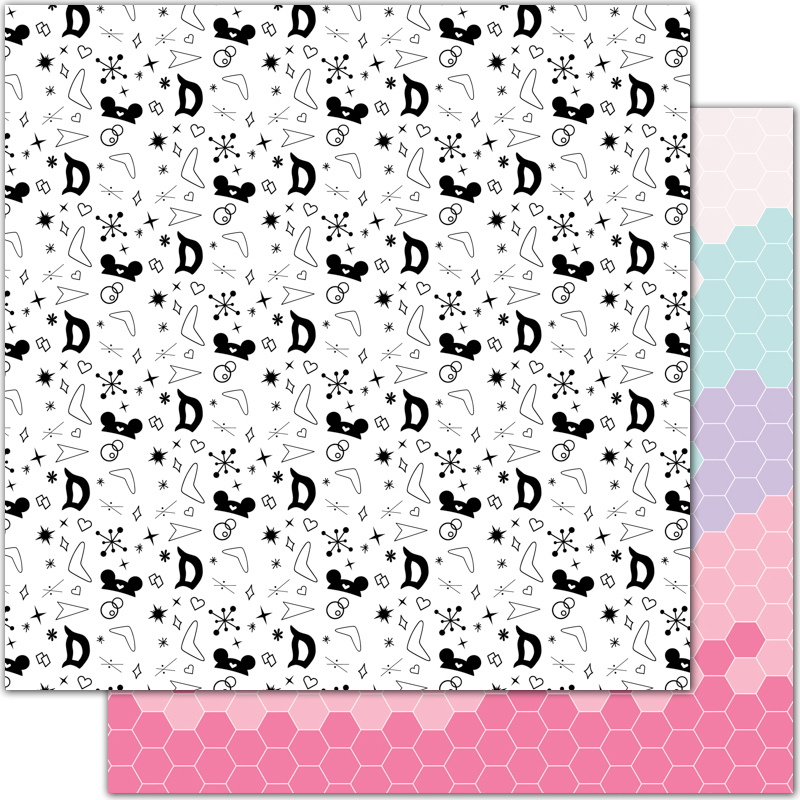 You can also find a few other fairytale references in the kit, like the pattern "abstract thought," which refers to Inside Out, and a little pink fox that was inspired by Fox and the Hound. And then there are also quite a few things that are reminiscent of Disneyland in the 1950's and 60's. I recently went to "Throwback Night" at Disneyland, which is kinda like Dapper Day, where everyone gets dressed up in vintage attire...and there was vintage music and lots of vintage photo booths, including an old malt shop setup with milkshakes, and I was definitely inspired by all of that as well! Some of the fun icons and images you can find in "Happy Day" include cute little houses, beautiful flowers, a little kitty, a fun little fox, some pretty butterflies, a cool retro pink phone, a yummy milkshake, and a really lovely girl! Okay, now let's go ahead and check out the 12x12 patterned paper in the kit. There are so many gorgeous patterns in this collection! One of my favorites is this cool geometric one called "Abstract Thought"! It is inspired by the scene in Inside Out where the characters are flattened down into shapes and colors. I love it because it also has this great retro 60's feel to it too and it incorporates pretty much all the colors in the "Happy Day" color scheme. I also really, really love this awesome floral that we did for this collection - "Call Me Flower." It is big and bold and the stripes behind it help to give it a lovely vintage feeling. All the beautiful flowers also really remind me of Springtime...which is quickly approaching! The adorable and super versatile pink and red polka dot on the back is also a favorite of mine and definitely has both a vintage feel and makes me think of Minnie Mouse! This next pattern, "Home is Where the Heart is," is really fun! The houses are way cute all lined up in a row! They are inspired by Minnie's house and they remind me of a perfect little neighborhood that I would so love to live in! The plaid on the back is so in right now, too! I love it! This next pattern, "Happy Day," may be my absolute favorite in the collection! It is really fabulous! It feels very modern and fresh but also kinda 60's vintage. It just makes me smile! I so love the beautiful butterflies on the back as well! They are so pretty! This sweet little heart pattern, called "Friends Forever," is so great! It definitely gives me Minnie vibes, and I think it would be so great to use as a whole or to fussy cut apart, as well, so you can use the individual hearts as embellishments, too! And the hounds-tooth on the back is a favorite of mine and very in right now! This next pattern, "Ticket to Imagination," is really, really perfect to fussy-cut! I love tickets! And you can cut the tickets in strips horizontally so as to use one whole strip of color or vertically so that you can get a multi-color look. You could also cut out the tickets individually. This paper is just so useful and awesome! Featured on this pattern, "On Hold, Hold On," the little vintage phone in the collection is one of my favorite icons! It is so cute and girly! It reminds me of Minnie's phone! I have always wanted a vintage phone like this! The black and white pattern on the back is also amazing and will work for so many different projects! The cut-apart sheets in the "Happy Day" collection are beautiful! This first one is appropriately called "Sweet Things." I love the cut-apart sheets in all the kits/collections we do because they are just so useful. The 2x2 and 3x4 cards are perfect for pocket pages especially! Here is the second cut-apart sheet in the collection, "Love." I super duper love the 3x4's and 4x6's in this one! Especially that super sweet and adorable kitty cat! The "love" 4x6 is definitely a favorite, too! And the pattern on the back is so kitschy-cute and vintage with the little heart cherries! It's another favorite pattern of mine for sure! Alright, now let's talk about the embellishments that come in "Happy Day". There are lots of great ones, but I think you can guess which one is my fave...the ephemera pack of course! We always do an ephemera pack with our kits because they are just so useful and beautiful and fun to play with! Plus...everyone loves them! And you can see why...they are just too cute for words! I love all the pieces, but I have to point out some of my favorites, of course! I am really in love with that kitty, and the phone, but also really adore the bingo card and the girl cameo and the little pink card with the butterflies on it...also the lovely flowers and hearts and butterflies...ok, I may have named almost everything...lol! Another awesome embellishment in this collection is the gold-foil sticker pack! I love the gold! It is so bright and shiny and happy! The gold script words like "happy day" and "love" and "princess" and "prince" are favorites of mine and so is the adorable little gold house! Our flair buttons are another really fabulous embellishment in our kits! We have done them before and they are definitely one of my fave things to play with! I love using them in particular to make cute little decorative paperclips, but they also work great just directly on your projects like sweet little buttons! And I think the little pink one that says "sweet" on it is my favorite! Washi tape!!! We have never done washi tape before and I am so excited that with the "Happy Day" kit/collection, we are doing washi tape for the first time! I love these washi tape strips! They are absolutely gorgeous! I think the butterflies washi tape is my fave...but also the one that says "happy day" across it and also the one that actually has the days of the week typed out on it! And now, let's take a look at all the fantastic and super cute planner pages that are in "Happy Day". These are some of my favorite planner dividers that we have had in any kit! I love all the pink and just how really happy and vintage and whimsical everything is! This planner divider is a favorite of mine! The three hearts on the ledger are super cute and so is the lovely vintage mint polka dot on the back! I love the quote on this planner divider, "I'll be your princess if you'll be my prince!" So magical! The vintage milkshake image in the kit is also one of my favorites, so of course I love this planner divider with the big strawberry milkshake on it! It has a cherry on top so it is fitting that the little heart cherry print is the one on the back of the page. The house divider with the quote "Home is where the heart is" is another favorite of mine! Love that great pink house with the heart window on top! 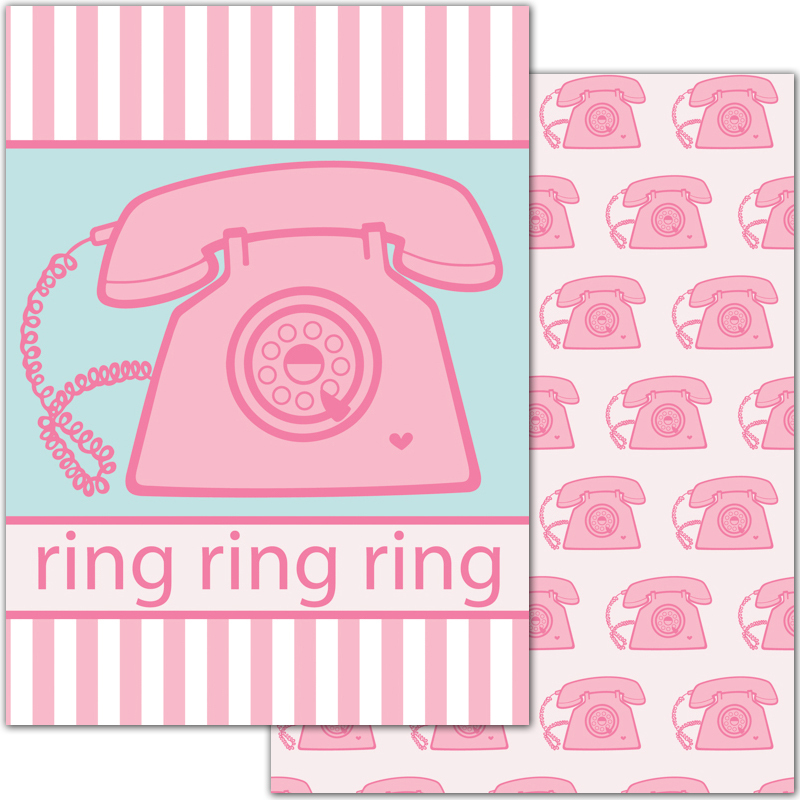 The vintage pink telephone planner divider that says "ring, ring, ring" is so cute! And it really makes me want to chat on the phone. Here is our beautiful butterfly planner divider...and it makes me smile so much when I look at it! It is so pretty! This planner page that says "every once in a while, in the middle of our everyday lives, when least expected, love shows up to grant us the fairytale" is so pretty with the teal and the little hearts! I love this quote! It is so true by the way! The floral planner pages in "Happy Day" are two of my favorites! They are so beautiful and girly and very happy! Love this big, bold red rose on the polka dots! And here is a lovely pink petunia! Love this one, too! It is pink...the pattern is my fave...and the word "petunia" is fun...enough said! I love this little pink fox planner divider! The fox is on top of a hounds-tooth background pattern and I think it perfectly conveys the Fox and the Hounds-tooth...I mean Fox and the Hound...inspiration! Hahaha...that is a wee bit punny! Get it?! Punny!!!! My cute pink kitty graphic is one of my favorites, as I said before...so it makes sense that this lavender and mint planner divider with the adorable pink kitty on it is a big favorite of mine, too! Can't wait to make it into a decorative dashboard in my planner! And this planner page is probably my absolute favorite! The pretty vintage girl with the butterfly in her flowing mint hair is just so fabulous! And I almost forgot about our transparency for "Happy Day", called "Happiness"...and it is so awesomely cute! Okay, in truth I didn't forget about it, because how could I?! I just saved the best for last! This is my favorite transparency that we have done so far for any of the collections and it is so graphic and fun and just so perfect to use for so many different things! I am particularly excited to put this one in my planner! Alright, so that is our full reveal of our newest kit/collection called "Happy Day"! I hope you love it as much as I do! The scrapbook, planner, and "happily ever after" kits of "Happy Day" are all now available for purchase on our website! Get yours today! I can't wait to see what you all make with this beautiful and happy kit! That is all for now...remember to live your life as a fairytale! Ta-ta for now!